​The mines, quarries, road cuts and streams in Missouri offer mineral enthusiasts the potential to add fine specimens to their collections. Despite its relatively simple geology, Missouri has large mineral resources, typically ranking among the top six States in the production of lead, zinc, silver, copper, lime, tripoli, fire clay and sand & gravel. A few other geologic commodities are produced but they are fairly insignificant. ​Currently the top mineral specimen producers are the mines of the Viburnum Trend in Southeast Missouri in Iron and Reynolds Counties. 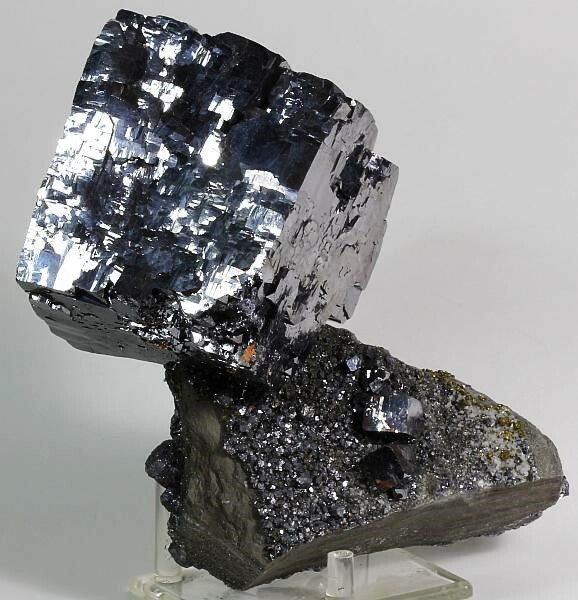 Superb specimens of galena, calcite, chalcopyrite, pyrite, and siegenite can be found in museum display cases around the world. The mines currently operating are Brushy Creek, Buick, Casteel, Fletcher, Sweetwater and West Fork. Some of the other mines in the Viburnum Trend have either closed, or have been incorporated into the present mines. Some of these include the Cominco, Indian Creek, Magmont, Viburnum No. 29 and Viburnum No. 35 mines. 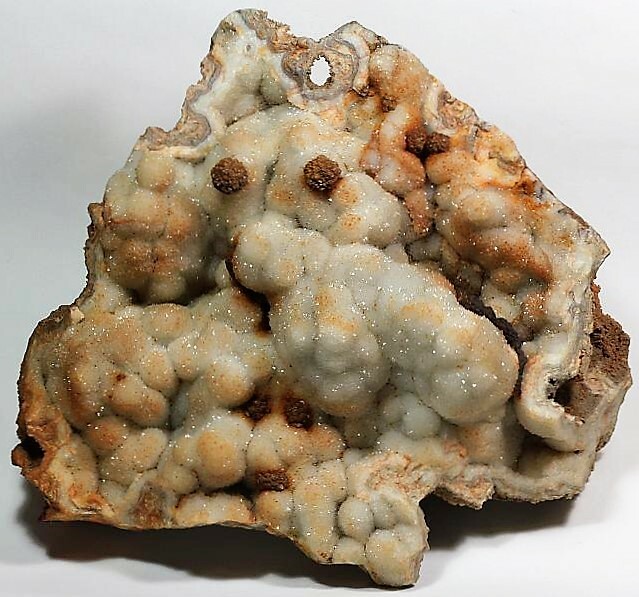 Calcite & Galena – West Fork Mine, Centerville, Viburnum Trend District, Reynolds County, Missouri - 27.5 x 15 x 15 cm. - Double terminated scalenohedral calcite crystals are on lustrous compound galena cubes. 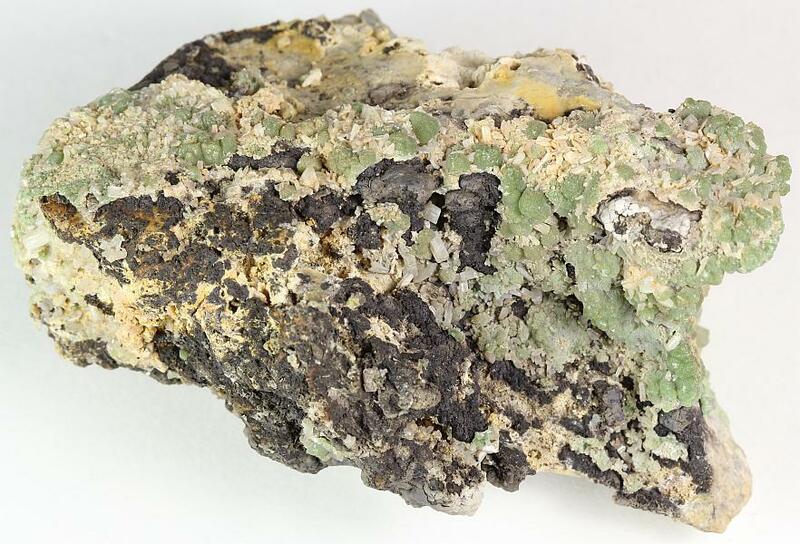 Marcasite on Galena – Sweetwater Mine, Ellington, Viburnum Trend District, Reynolds County, Missouri - 10 x 7 x 6.6 cm. - Octahedral galena crystals to 3 cm long are completely covered by a later generation of marcasite crystals. 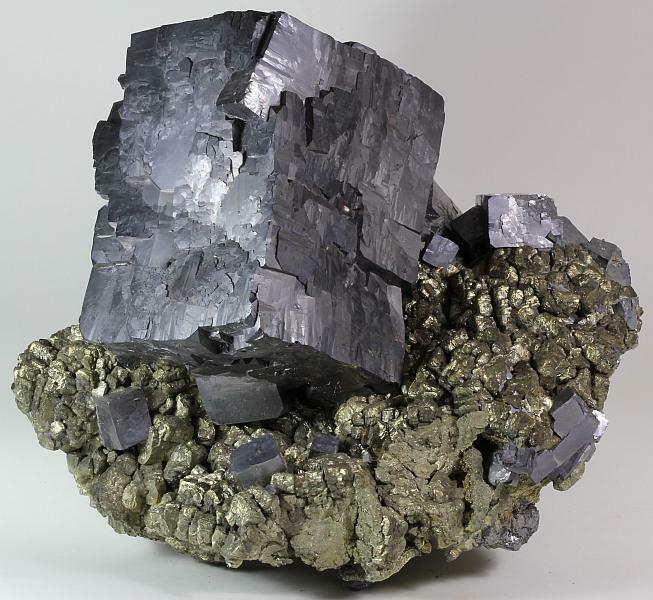 Galena & Pyrite – Brushy Creek Mine, Oates, Viburnum Trend District, Reynolds County, Missouri - 28.5 x 26 x 20 cm. - This specimen is a floater! A remarkable pocket was found in Stope 72B30 where almost every specimen was in a clay layer, so there aren’t any points of attachment to matrix. 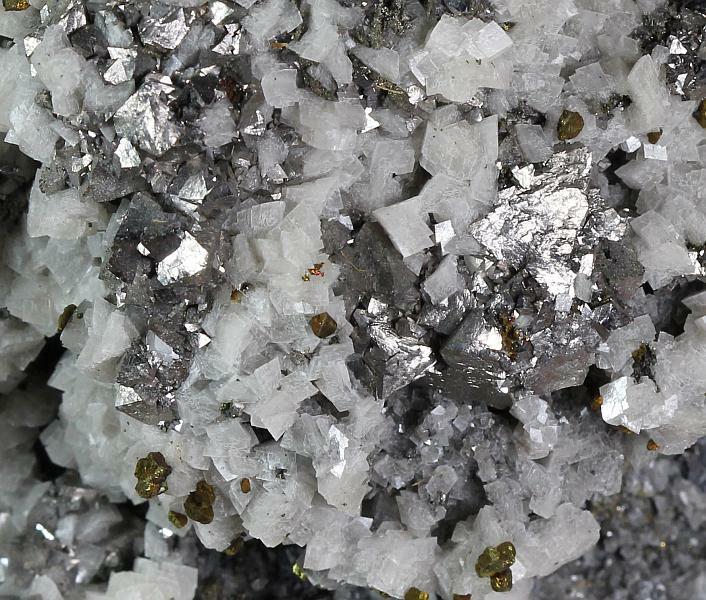 The vast majority of the specimens were mainly galena with minor chalcopyrite, but a few had pyrite. 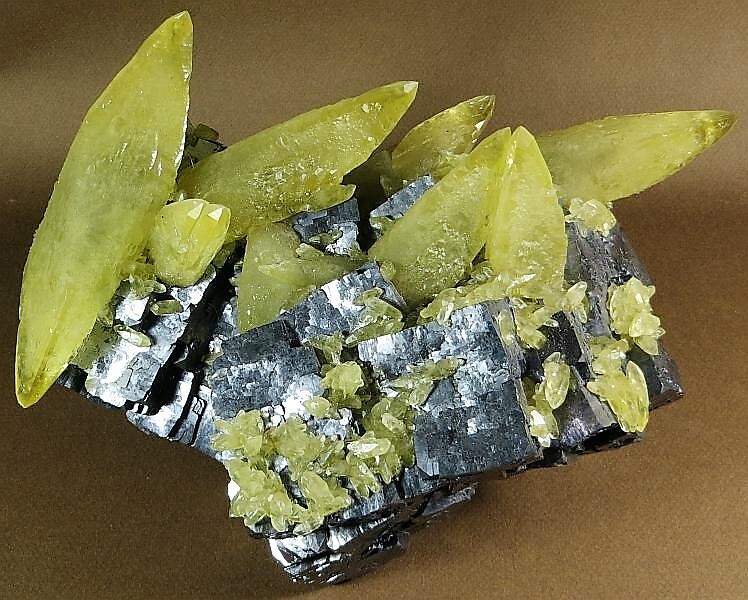 Quartz on Galena – Magmont Mine, Bixby, Viburnum Trend District, Iron County, Missouri - 18.5 x 15 x 10.5 cm. 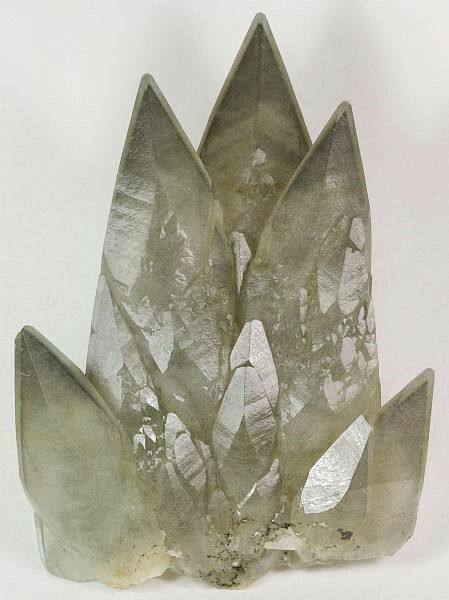 - Lustrous quartz crystals richly coat cube-octahedral galena crystals. Almost all of the displayable quartz specimens found in the Viburnum Trend came out of either the Magmont or Buick Mine. Galena – Brushy Creek Mine, Oates, Viburnum Trend District, Reynolds County, Missouri - 8 x 5 x 5 cm. - A mirror-luster galena cube with prominent octahedral corners has some smaller cube-octahedral galena crystals in association. 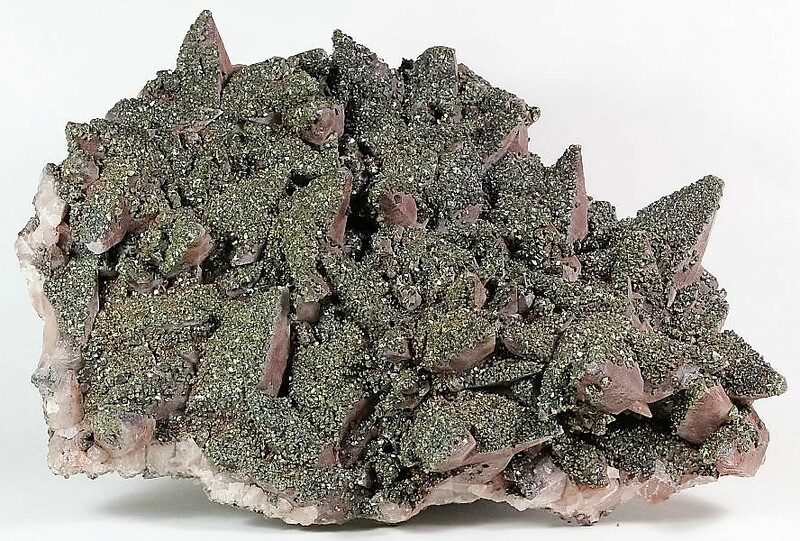 Marcasite & Galena – Brushy Creek Mine, Oates, Viburnum Trend District, Reynolds County, Missouri - 14 x 8 x 5.5 cm. 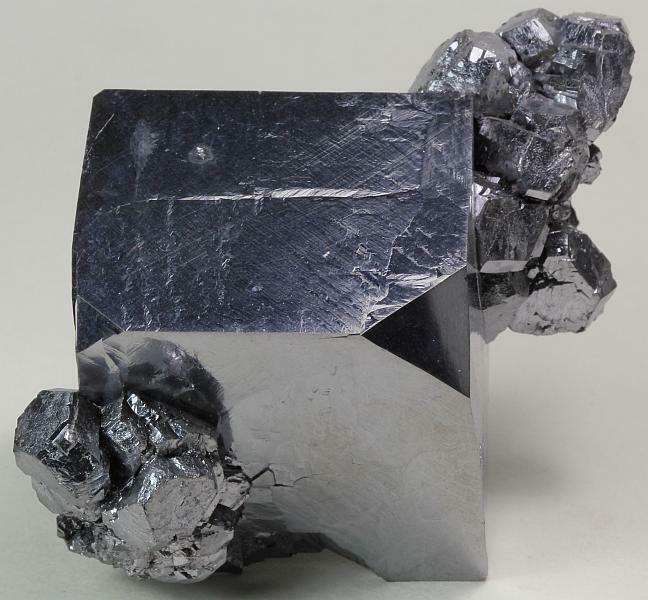 - A galena cube aesthetically grew on shiny marcasite. 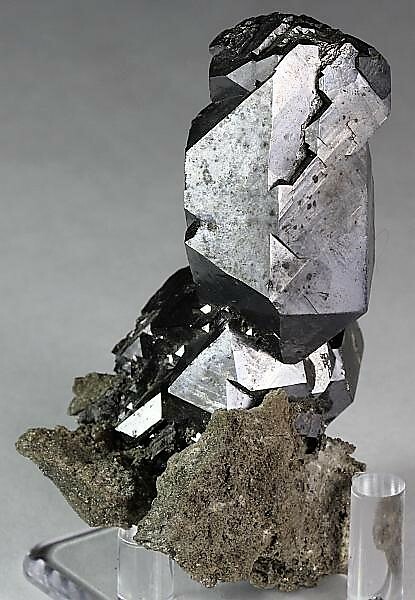 Some small galena and dolomite crystals are scattered across the top and back of this specimen. 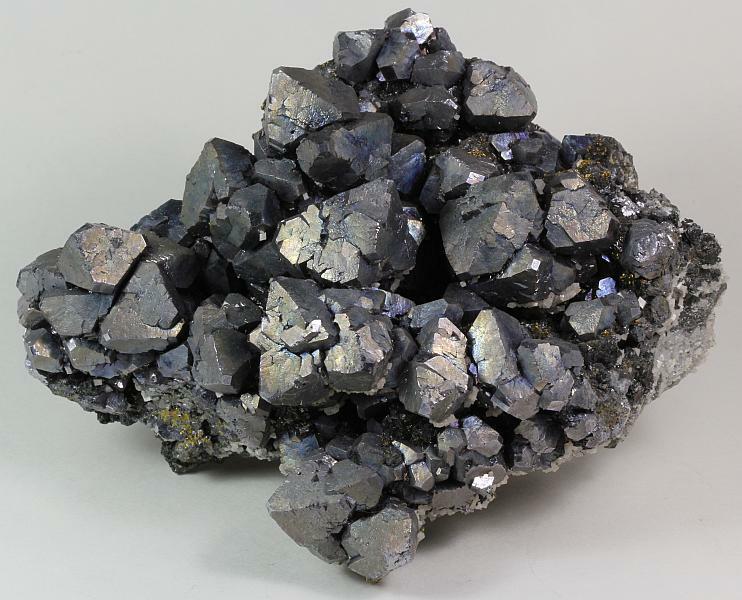 Galena – Brushy Creek Mine, Oates, Viburnum Trend District, Reynolds County, Missouri - 15.5 x 10.5 x 9 cm. - There are several complex spinel twin galena crystals to 4.5 cm in length on this specimen. All of the crystals have a nice iridescent sheen. 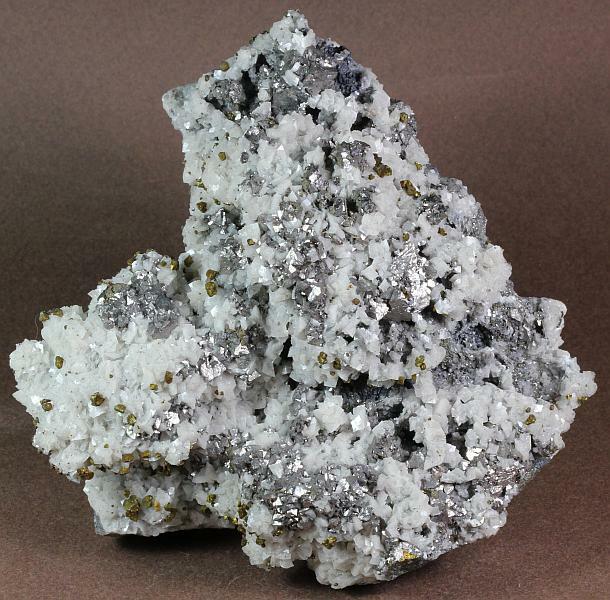 Galena – Brushy Creek Mine, Oates, Viburnum Trend District, Reynolds County, Missouri - 15 x 12 x 8.5 cm. - Iridescent octahedral galena crystals dominate this specimen that also has sphalerite, dolomite and chalcopyrite in association. The iridescence is caused by a microscopic layer of chalcopyrite on the galena. 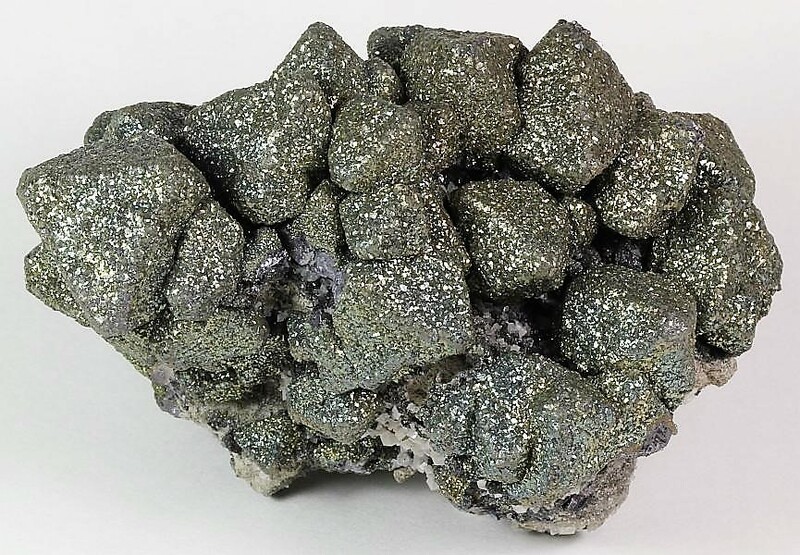 Pyrite – Brushy Creek Mine, Oates, Viburnum Trend District, Reynolds County, Missouri - 19 x 13 x 11 cm. 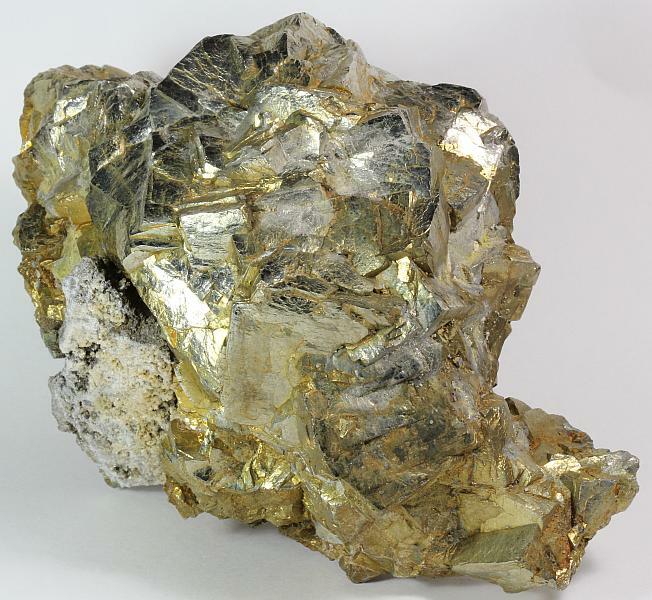 - Large clusters of pyrite crystals are rare in Brushy Creek Mine. This one is very lustrous. Calcite – Sweetwater Mine, Ellington, Viburnum Trend District, Reynolds County, Missouri - 12.5 x 5 x 5 cm. - This hexagonal calcite crystal has dolomite, galena and chalcopyrite inclusions. Covellite – Sweetwater Mine, Ellington, Viburnum Trend District, Reynolds County, Missouri - 2.4 x 2.2 x 0.9 cm. - A sharp iridescent compound covellite crystal has some marcasite and calcite in association. Covellite crystals of this size are very rare in the Viburnum Trend. Galena – Indian Creek Mine, Ebo, Viburnum Trend District, Washington County, Missouri - 8 x 5.5 x 4 cm. - Indian Creek Mine was an outlier deposit of the Viburnum Trend. 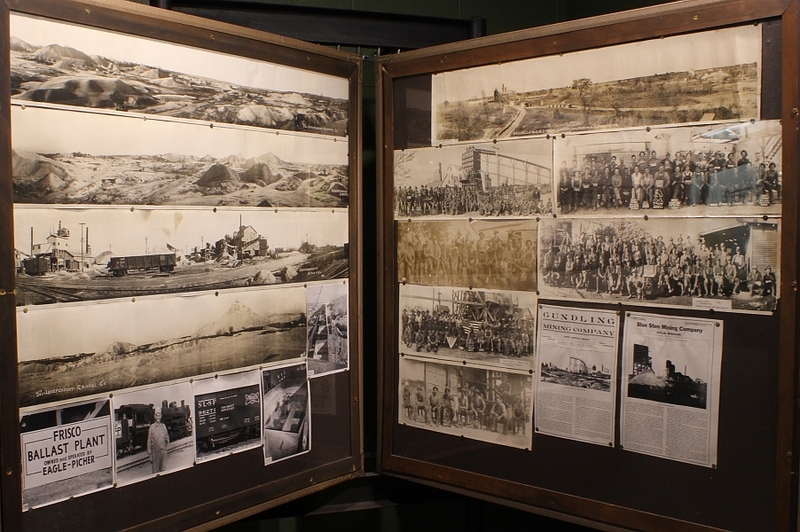 Although it produced some very good specimens, it wasn’t open very long so pieces from there are very scarce. This one features a highly modified twinned crystal on dolomite matrix. Galena close-up - Brushy Creek Mine, Oates, Viburnum Trend District, Reynolds County, Missouri. Calcite – Sweetwater Mine, Ellington, Viburnum Trend District, Reynolds County, Missouri - 14 x 10 x 7 cm. - Very distinct phantoms are visible in the crystals due to a thin layer of chalcopyrite on the interior crystals. 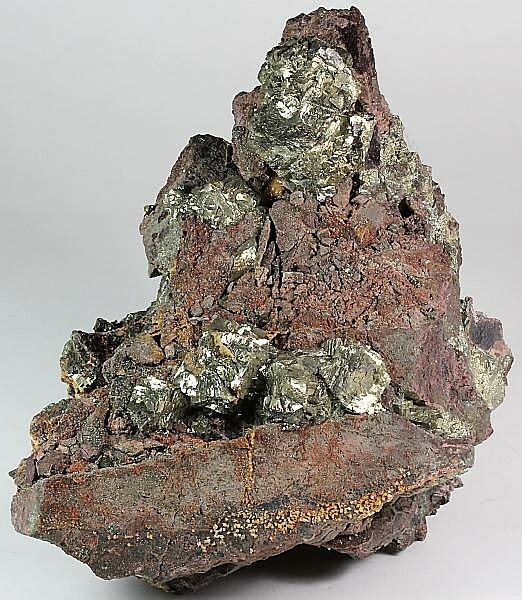 Pyrite – Buick Mine, Bixby, Viburnum Trend District, Iron County, Missouri - 20 x 6.5 x 5 cm. - In the 1970’s the pocket was discovered that had these pyrite “bars”. Some of the specimens had central holes revealing that these were stalactitic. A classic Viburnum Trend specimen. 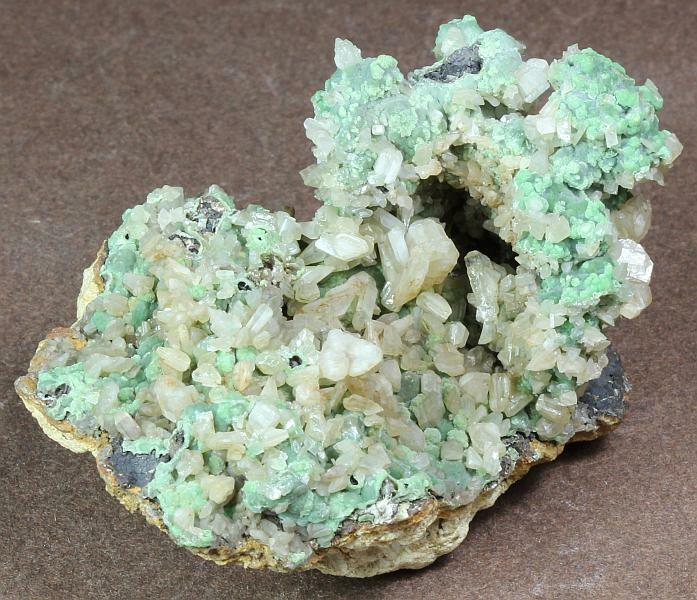 Siegenite – Sweetwater Mine, Ellington, Viburnum Trend District, Reynolds County, Missouri - 13.5 x 13 x 7 cm. 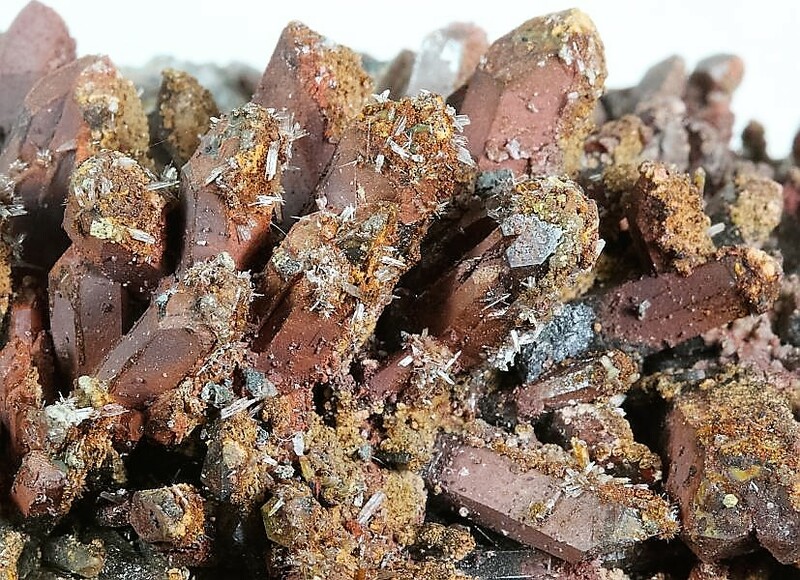 - Bright siegenite crystals to 1.3 cm contrast well with the white rhombic dolomite crystals. The siegenite crystals are very large for the species! Siegenite close-up - Sweetwater Mine, Ellington, Viburnum Trend District, Reynolds County, Missouri. 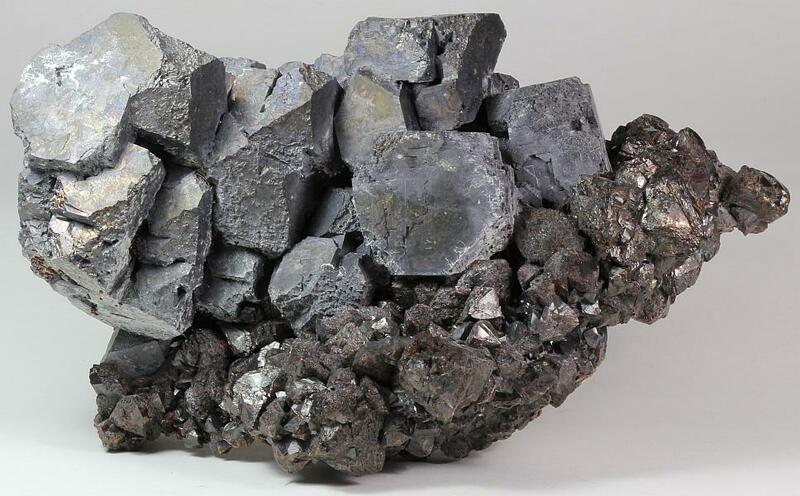 Galena – Brushy Creek Mine, Oates, Viburnum Trend District, Reynolds County, Missouri - 17 x 11.5 x 10 cm. 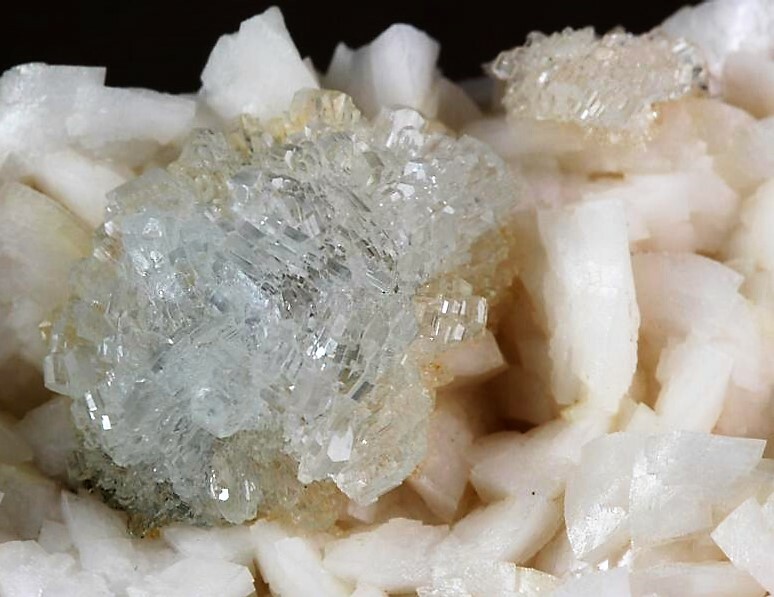 - This specimen features compound octahedral crystals to 8 cm in length. There’s some minor dolomite and chalcopyrite also present. 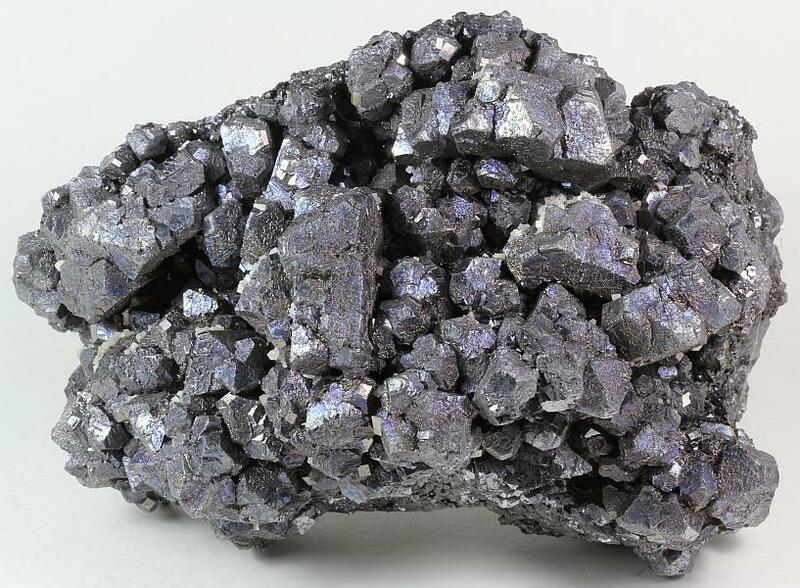 Galena – Sweetwater Mine, Ellington, Viburnum Trend District, Reynolds County, Missouri - 17.5 x 15 x 10 cm. - A cubic lustrous galena crystal with octahedral beveled corners sits on dolomite matrix that’s sprinkled with small galena cubes. 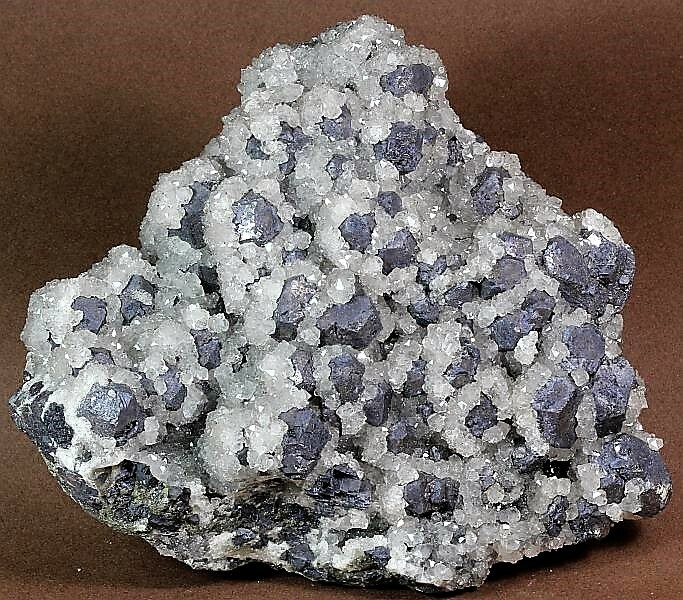 Marcasite after Anhydrite – Sweetwater Mine, Ellington, Viburnum Trend District, Reynolds County, Missouri - 5.6 x 2.3 x 0.5 cm. - This epimorph formed when marcasite grew over a sharp anhydrite crystal, then the anhydrite naturally dissolved away. These oddities are fairly rare in the Viburnum Trend. 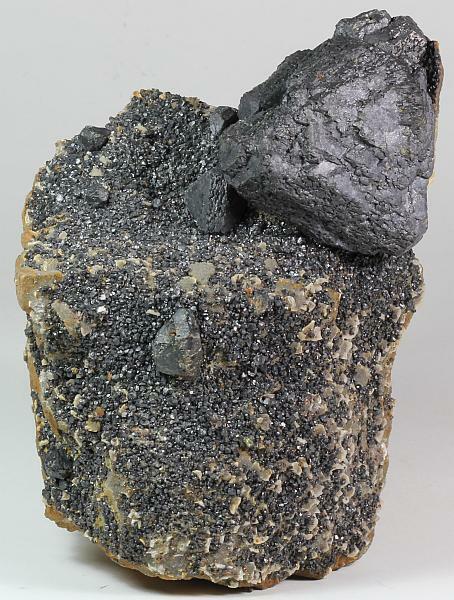 Galena – Brushy Creek Mine, Oates, Viburnum Trend District, Reynolds County, Missouri - 5.4 x 4.4 x 3.6 cm. - A sharp spinel twin galena has cube-octahedral galena, dolomite and chalcopyrite with it. Calcite – Sweetwater Mine, Ellington, Viburnum Trend District, Reynolds County, Missouri - 20.5 x 12 x 9 cm. - The scalenohedral calcite crystal is on a dolomite matrix that has some small galena and chalcopyrite crystals scattered on it. ​The Tri-State Mining District was a fantastically prolific specimen producing area, but all of these mines have been closed for decades. 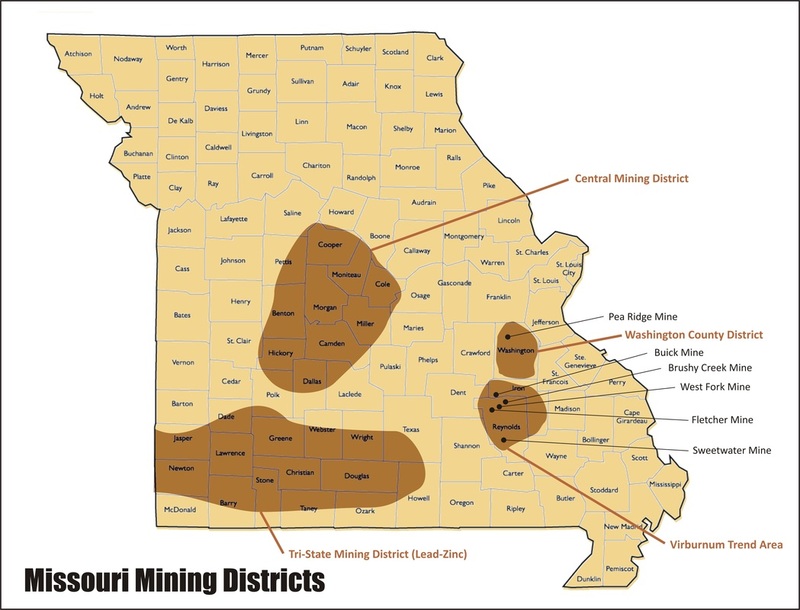 This mining district was in parts of 15 counties in Southwest Missouri, plus Cherokee County, Kansas and Ottawa County, Oklahoma. The mines near the Missouri towns of Granby, Joplin, Oronogo,Duenweg and Webb City were among the most famous for fine specimens. Even though the Tri-State District and the Viburnum Trend are about 175 miles apart there are quite a few specimens mislabeled as to their location. There are two easy ways to determine which of these mining districts a piece is from. 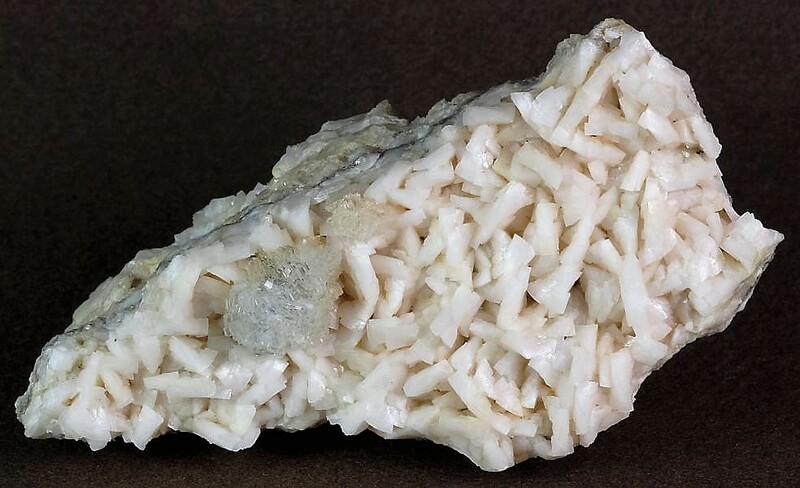 Specimens from the Viburnum Trend have a limestone or dolostone matrix, and usually have individual small white to cream colored rhombic dolomite crystals. Specimens from the Tri-State District are on chert matrix, and the pink dolomite crystals are larger and are curved to saddle shaped. Hemimorphite – Granby, Tri-State District, Newton County, Missouri - 15 x 9 x 3 cm. 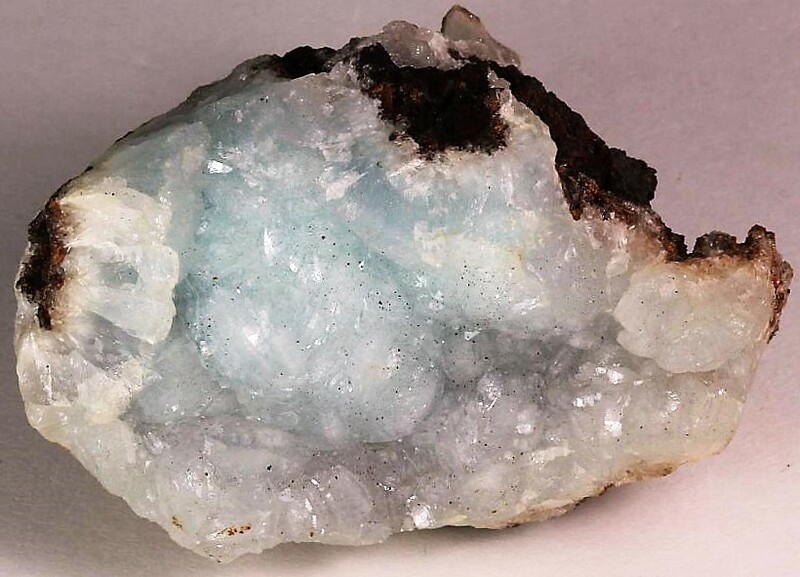 - This rare cadmium-rich hemimorphite specimen features very lustrous crystals. Ex Field Museum of Natural History in Chicago. 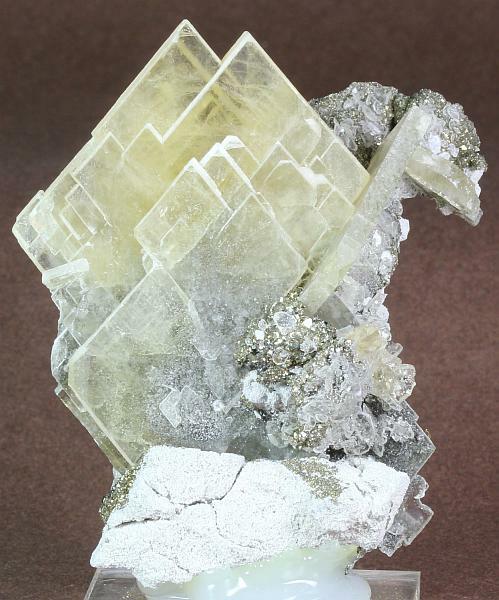 Calcite – Joplin, Tri-State District, Jasper County, Missouri - 15 x 13.5 x 9 cm. - Amber to pale yellow calcite crystals cover chert matrix. 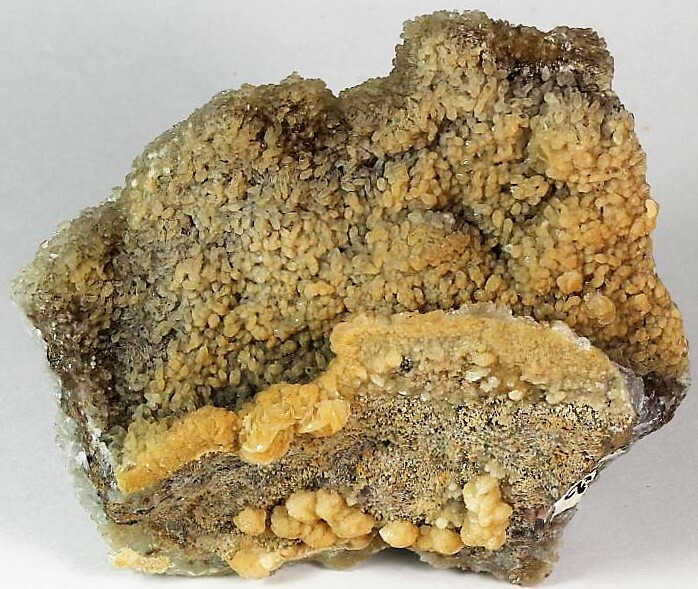 Calcite – Joplin, Tri-State District, Jasper County, Missouri - 18 x 6.5 x 6 cm. - These elongated twinned calcite crystals were relatively rare in the Tri-State District. 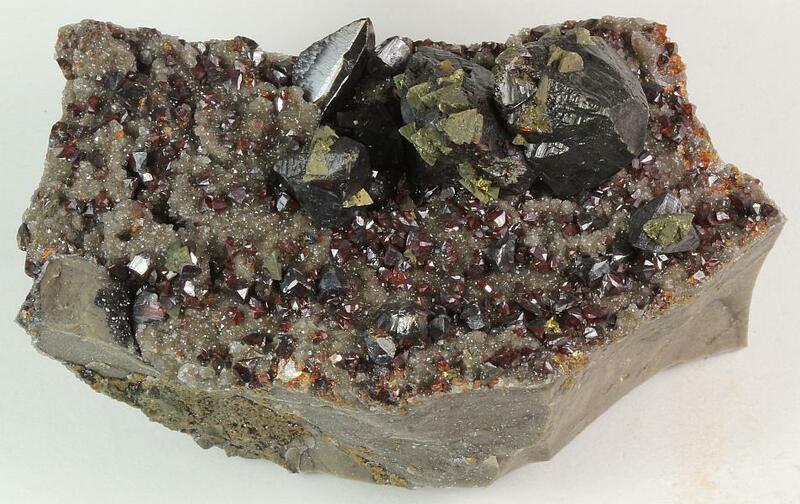 Sphalerite – Joplin, Tri-State District, Jasper County, Missouri - 18 x 12 x 12 cm. - A 7.5 cm sphalerite crystal is on chert matrix with smaller sphalerite crystals. Hemimorphite &Smithsonite – Joplin, Tri-State District, Jasper County, Missouri - 8.6 x 7.7 x 4.1 cm. - One side of this specimen has lustrous hemimorphite while the other side has dull “rice grain” smithsonite crystals. 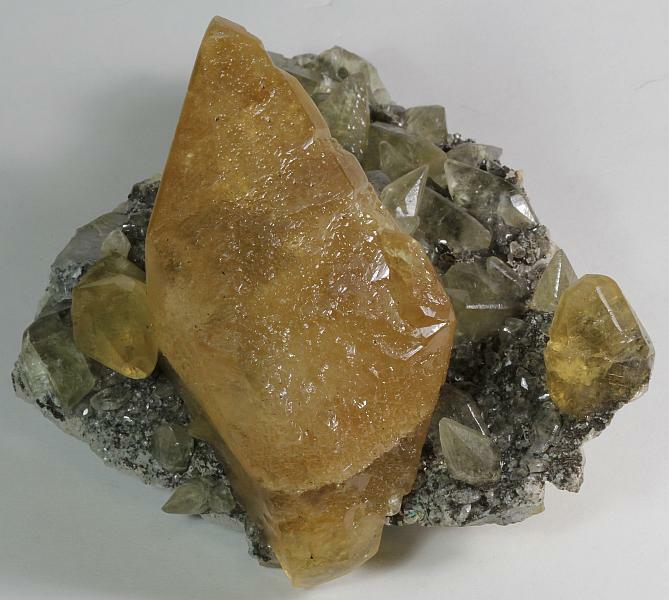 Calcite – Joplin, Tri-State District, Jasper County, Missouri - 11 x 9 x 7 cm. 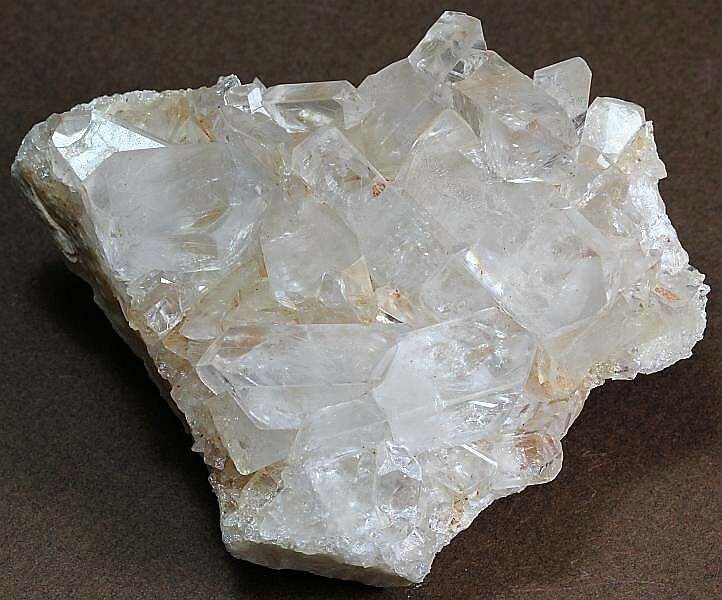 - This scalenohedral calcite crystal has a late-stage white layer, giving it a frosted look. 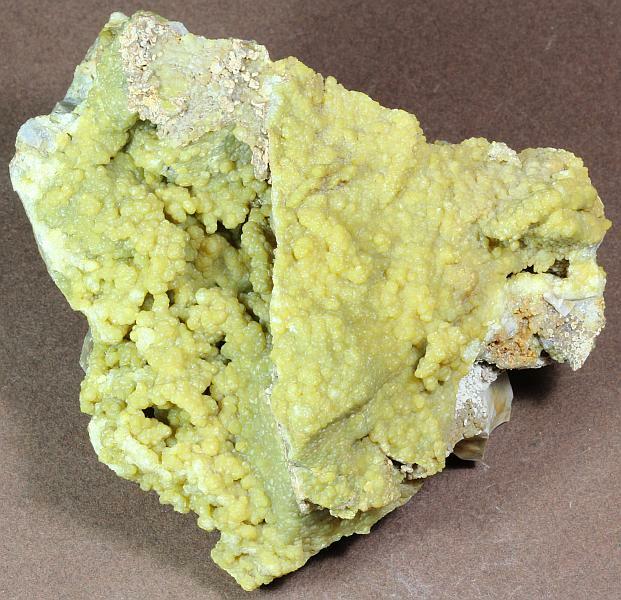 Cerussite & Pyromorphite –Tri-State District, Missouri - 6 x 4.5 x 4 cm. - Twinned cerussite crystals are on globular pyromorphite. Secondary lead and zinc minerals were very rare in the Tri-State District, and were only found in the deposits that were near the ground surface. Nearly all of these specimens were found in the late 1800’s to early 1900’s. 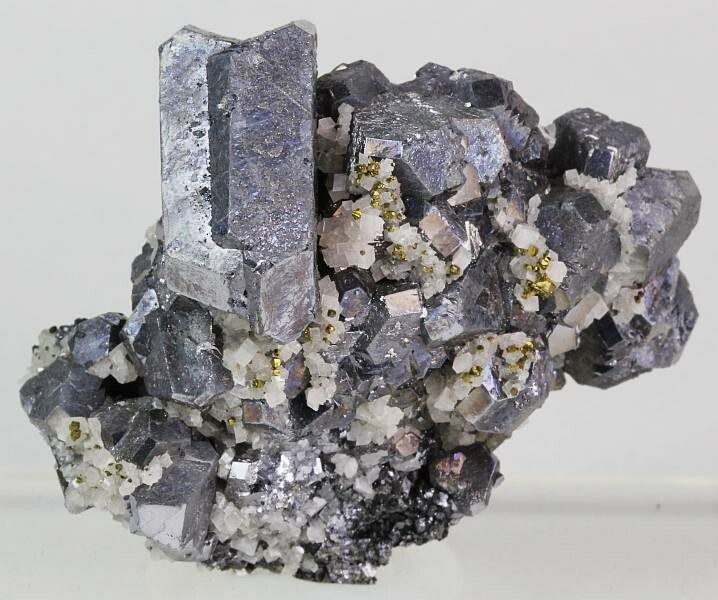 Galena & Sphalerite – Joplin, Tri-State District, Jasper County, Missouri 21 x 13 x 10 cm. Naturally etched cube-octahedral galena crystals are on sphalerite crystals. Sphalerite & Chalcopyrite – Joplin, Tri-State District, Jasper County, Missouri - 9 x 4.5 x 4.5 cm. - Sphalerite crystals have some aligned chalcopyrite crystals in association. The miners in the Tri-State District called the dark sphalerite crystals “black-jack”, and the red sphalerite crystals “ruby-jack”. Hemimorphite & Dolomite – Granby, Tri-State District, Newton County, Missouri - 7 x 4 x 3.4 cm. - A lustrous hemimorphite spray is on light pink dolomite crystals. 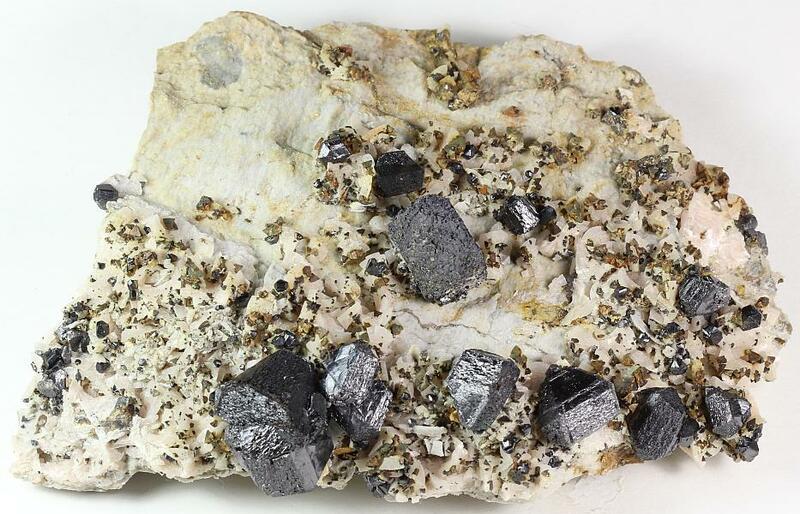 Sphalerite, Galena, Chalcopyrite & Dolomite – Joplin, Tri-State District, Jasper County, Missouri - 16 x 11 x 4 cm. 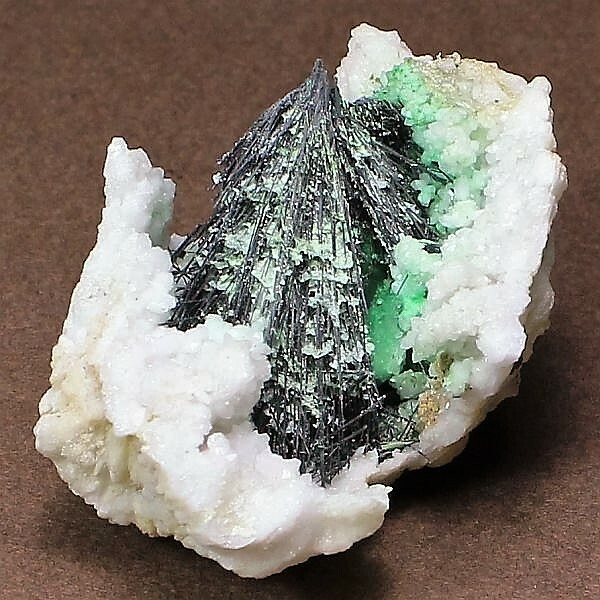 - This specimen features four of the collectable minerals found in the Tri-State District. The galena shows signs of dissolution. 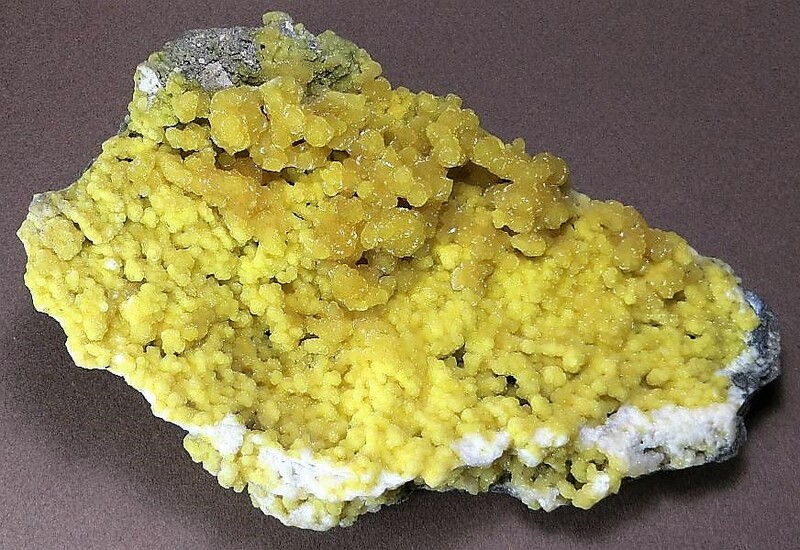 Smithsonite – Oronogo Circle Mine, Oronogo, Tri-State District, Jasper County, Missouri - 11 x 10 x 7 cm. - Oronogo was famous for cadmium-rich smithsonite specimens. This one has good coverage on chert matrix. Hemimorphite– Beer Cellar Mine, Granby, Tri-State District, Newton County, Missouri - 7 x 5.5 x 4.8 cm. - An extremely rare bluish hemimorphite from the Tri-State District. 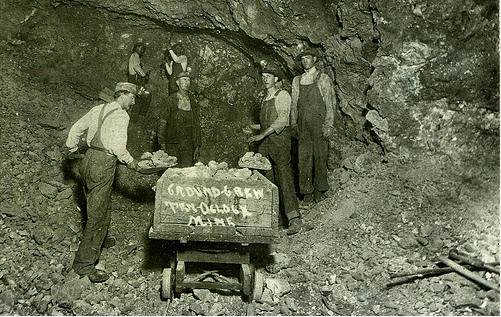 The Beer Cellar Mine was the only mine in Missouri that produced leadhillite crystals. Calcite – Webb City, Tri-State District, Jasper County, Missouri - 12 x 7 x 5 cm. 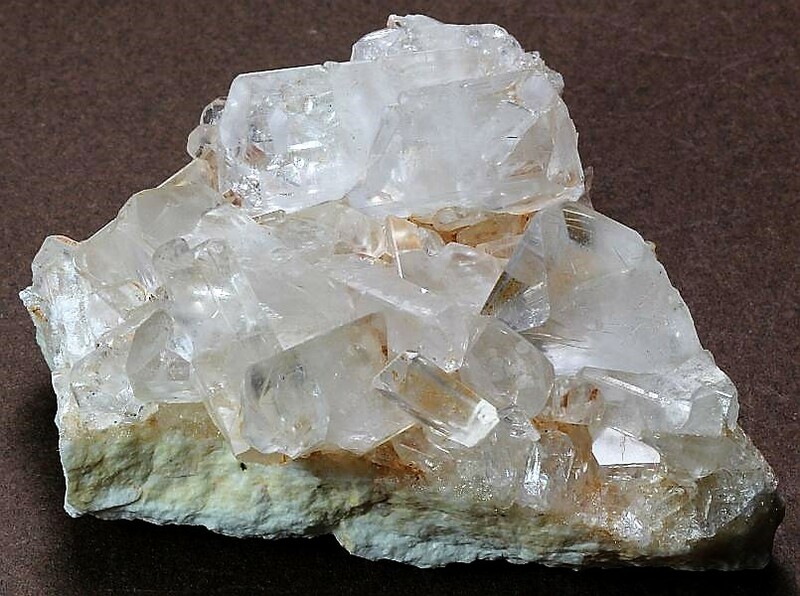 - Webb City was famous for the twinned calcite crystals found there. This one features a faint phantom layer, and has just a tinge of purple color. Pyromorphite & Cerussite – Granby, Tri-State District, Newton County, Missouri - 7.7 x 5.6 x 3.7 cm. - Pyromorphite and cerussite crystals are on dull corroded galena crystals. Ex Harvard Mineral Museum. Hemimorphite & Dolomite close-up - Granby, Tri-State District, Newton County, Missouri. ​Missouri has a LOT of limestone quarries throughout the State. Many of these produce calcite crystals, and some also produce barite, pyrite or millerite specimens. The limestone and shale layers are also exposed in road cuts and streams, and some of these have geodes that contain a nice variety of minerals. There are also some granite quarries and outcrops. Pegmatite pods within the granite are relatively rare, but they occasionally produce displayable specimens. John Sinkankas even made mention of Missouri pegmatite specimens in his “Emerald and Other Beryls” book. 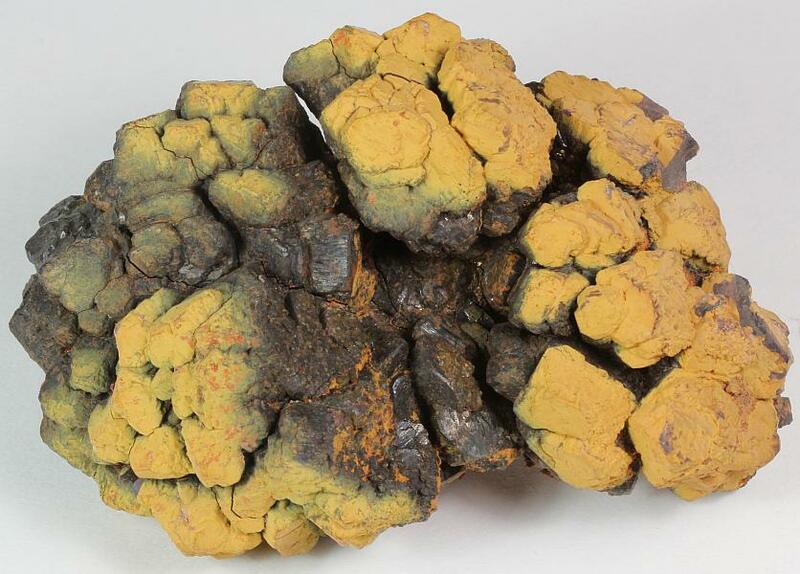 Limonite & Goethite – Caseyville, Franklin County, Missouri - 9.5 x 5.9 x 3.8 cm. - This limonite and goethite after pyrite pseudomorph was found in a ditch along Highway 185. 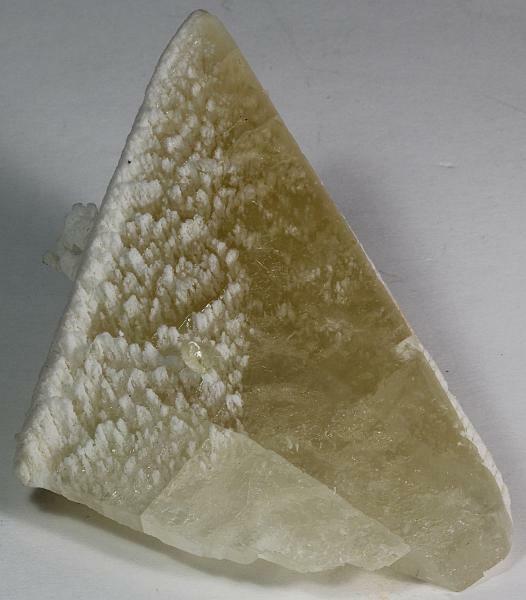 Calcite – Capital Quarry, Rolla, Phelps County, Missouri - 24 x 21 x 8 cm. - Amber colored calcite crystals, which have deeper colored cores, cover the display surface. 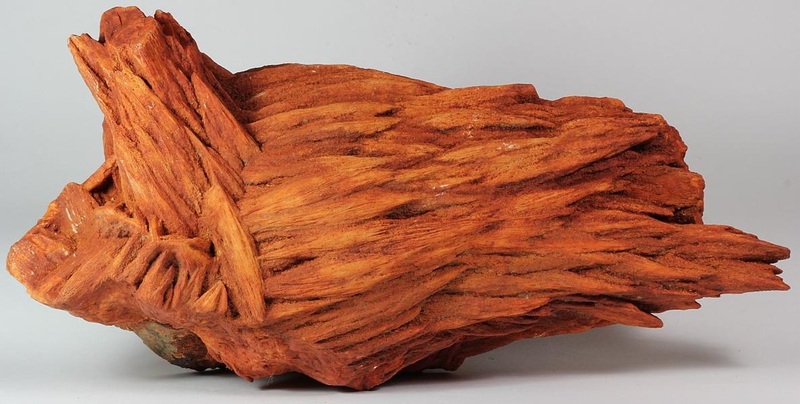 Millerite – Leadwood, St Francois County, Missouri - 8 x 5 x 2.5 cm. - A 3 cm long millerite spray is in a dolomite vug. Found in a road cut on Highway 8. 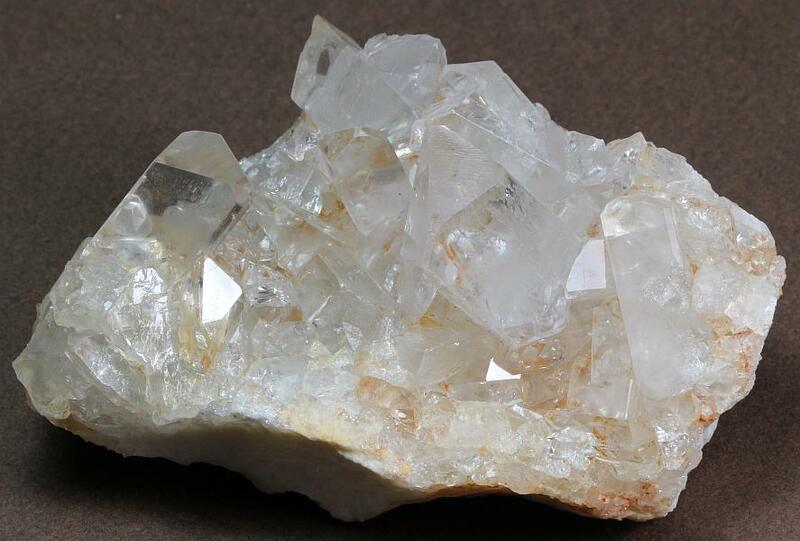 Quartz – St Francisville, Clark County, Missouri - 9.5 x 8 x 6.9 cm. - Light smoky quartz crystals are on white chalcedony. It’s not hard to realize why these are called “dewdrop” geodes. Limestone and shale layers in Northeast Missouri, Southeast Iowa and the adjacent area in Illinois contain numerous geodes. 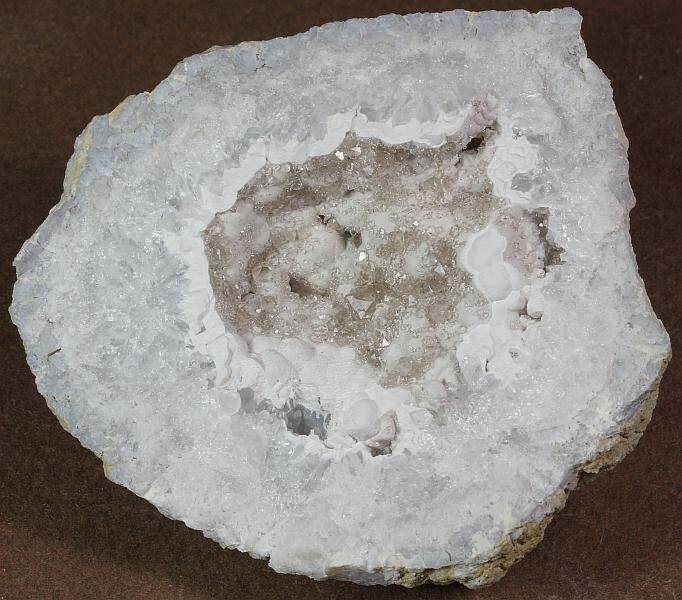 Any quarry, road cut or stream that intersects the right rock layer produces geodes. 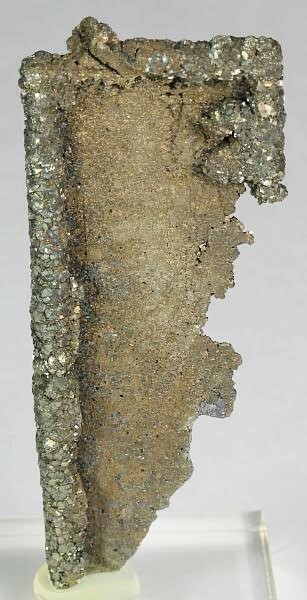 Honessite after Millerite – Antire Road, St Louis County, Missouri - 5.2 x 4 x 3.5 cm. - A small area near Antire Road in St Louis County produced these specimens in the 1960’s. Quartz geodes were completely filled with calcite. These had to be put in a weak acid solution to remove the calcite, and sometimes honessite after millerite was in the geode. This is an exceptionally large spray. Most of the sprays were about 1 cm in length. Quartz close-up - St Francisville, Clark County, Missouri. 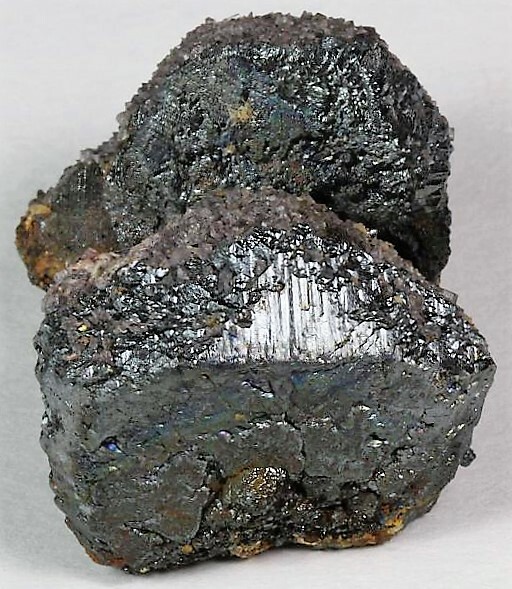 Goethite – Poplar Bluff, Butler County, Missouri - 21.5 x 13 x 10 cm. 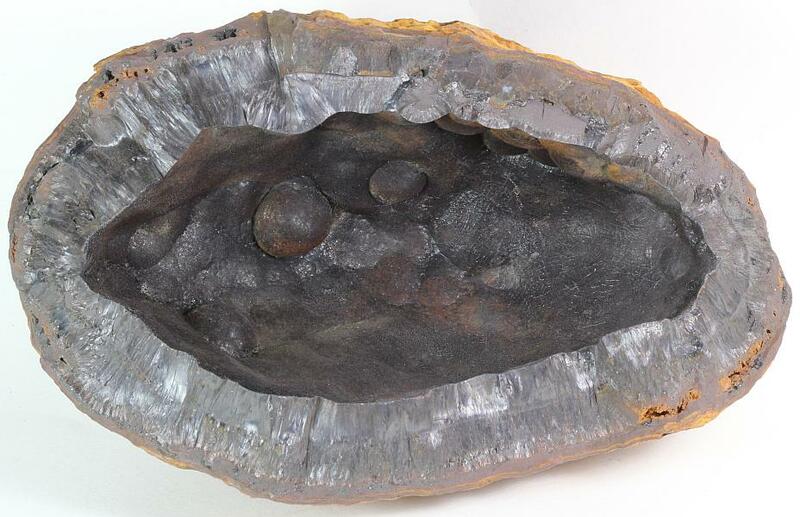 - This partial nodule was found when a by-pass highway was constructed around Poplar Bluff. 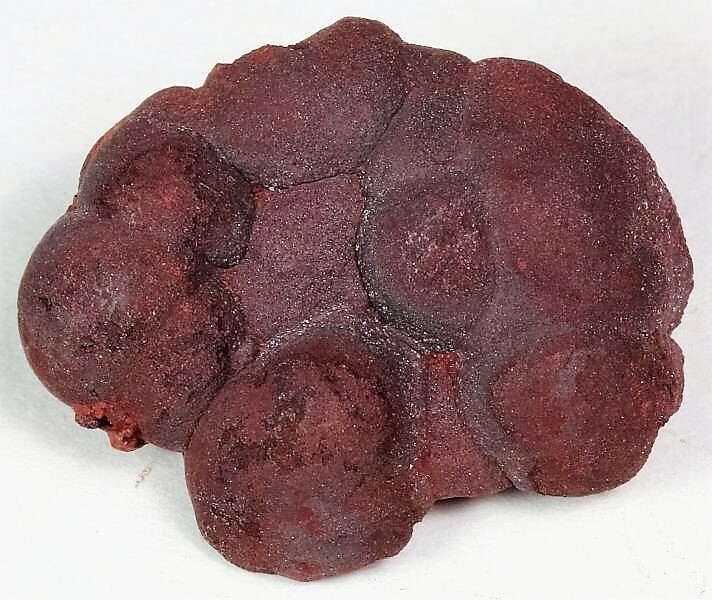 The structure of this nodule is good for a Missouri goethite specimen. Calcite – Coldwater, Wayne County, Missouri - 17 x 14 x 8 cm. - The double terminated scalenohedral calcite crystal is covered with a secondary layer of aligned low-angle rhombohedral calcite. This specimen was found in a road cut when a highway was widened. Fluorite, Smoky Quartz, Orthoclase & Chlorite – Sheehan Quarry, Graniteville, Iron County, Missouri - 7.7 x 7.5 x 6.2 cm. - An octahedral fluorite crystal with aligned cubic overgrowths is in association with several other minerals. Fluorite crystals are very rare in the pegmatite pods of Missouri. 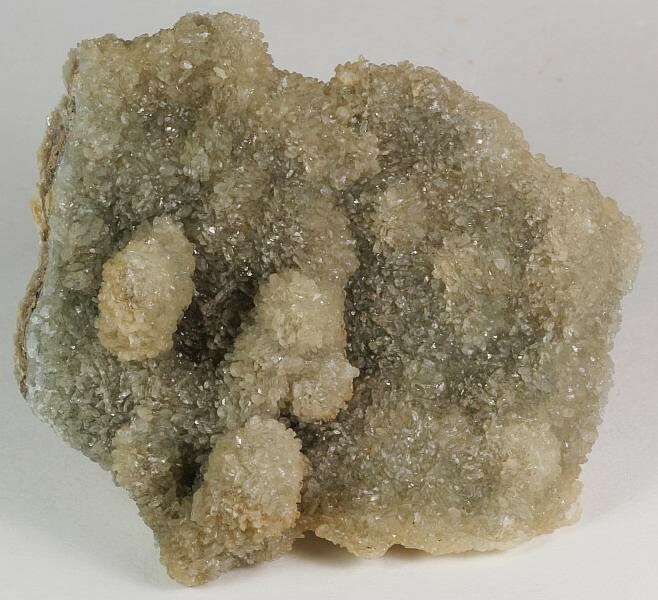 Barite – Capital Quarry, Rolla, Phelps County, Missouri - 9.3 x 7.3 x 4 cm. - Aligned pale yellow barite crystals have white edges. There’s some minor pyrite in association. Fluorite, Smoky Quartz, Orthoclase & Chlorite close-up - Sheehan Quarry, Graniteville, Iron County, Missouri. 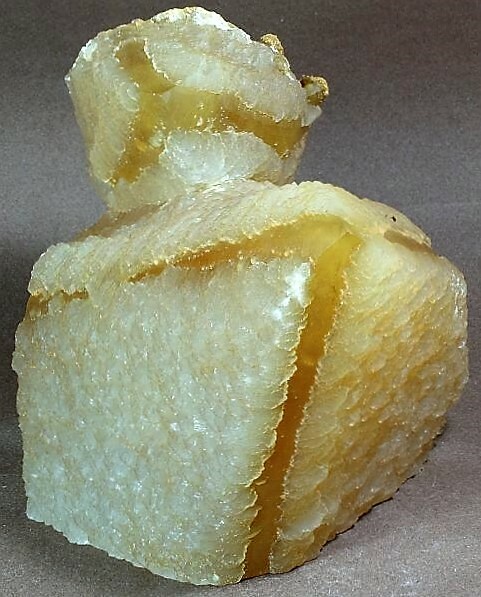 Calcite – Williamsville Stone Quarry, Hendrickson, Butler County, Missouri - 16 x 13 x 11.5 cm. - The original scalenohedral calcite crystals are almost completely covered with a secondary layer of aligned low-angle rhombohedral calcite. ​There used to be two important barite mining districts but both closed many years ago. Specimens from the Washington County District are typically stained a dark reddish color due to iron in the soil, while specimens from the Central District (which was mainly in Morgan, Moniteau, Cole, Miller, and Camden Counties) have cream-white to colorless crystals. A note of interest: Moses Austin, father of Stephen F. Austin of Texas fame, was very interested in developing lead mines in Washington County, Missouri. 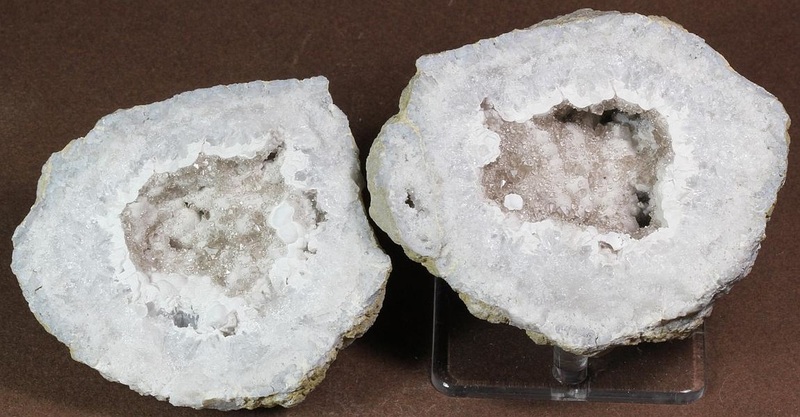 This ultimately resulted in the discovery of many of the barite deposits there. Barite – Blackwell Pit, Tiff, Washington County, Missouri - 35 x 15 x 14 cm. 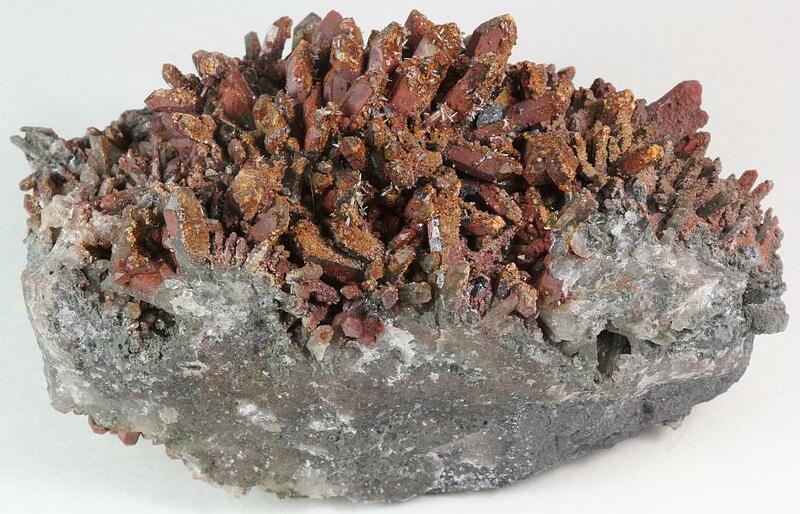 - This large cluster of “bladed” barite has the typical dark reddish color of specimens from this district. The specimens weather out of the late Cambrian age Potosi Formation, and are found in dark reddish clay. 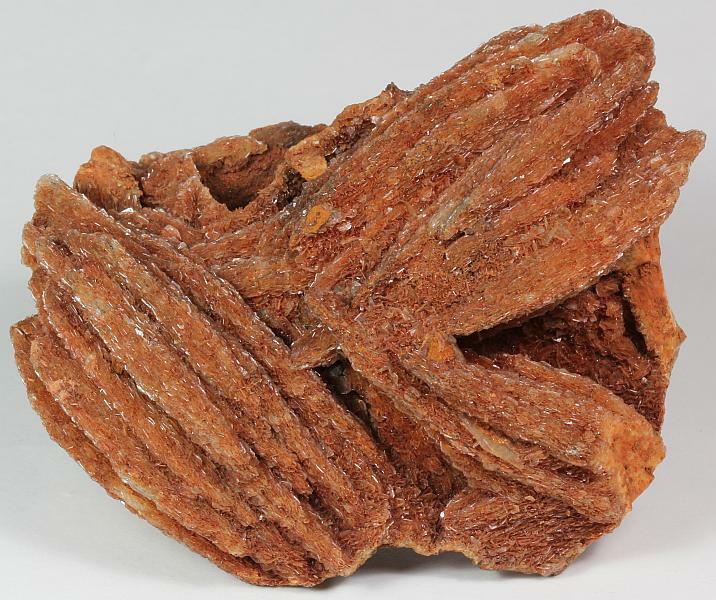 Barite – Lamb Mine, Gravois Mills, Morgan County, Missouri - 7.9 x 4.9 x 3.9 cm. - Gemmy tabular barite crystals are on a massive barite matrix. The Lamb Mine closed in the 1950’s, and is now almost entirely naturally recovered by Mother Nature. Barite – Blackwell Pit, Tiff, Washington County, Missouri - 11 x 8.9 x 4.3 cm. 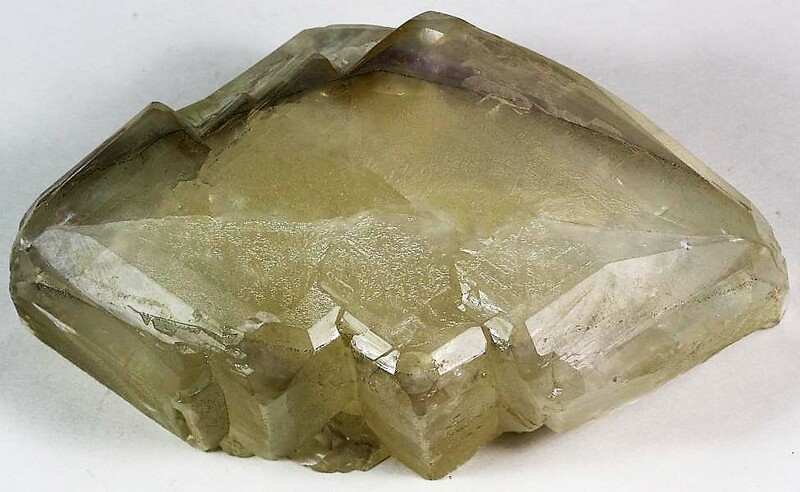 - Clear tabular “glassy” barite crystals are on the larger “bladed” barite crystals. 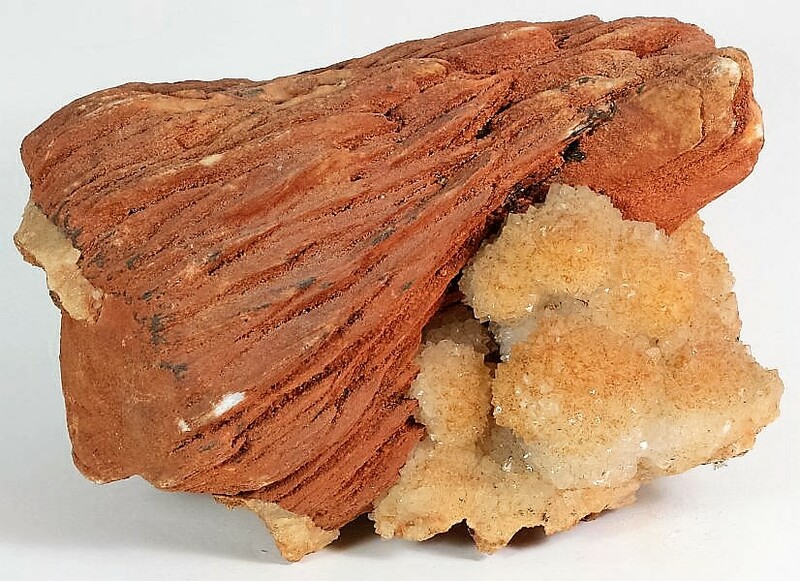 Barite – Lamb Mine, Gravois Mills, Morgan County, Missouri - 7.7 x 6 x 3.5 cm. 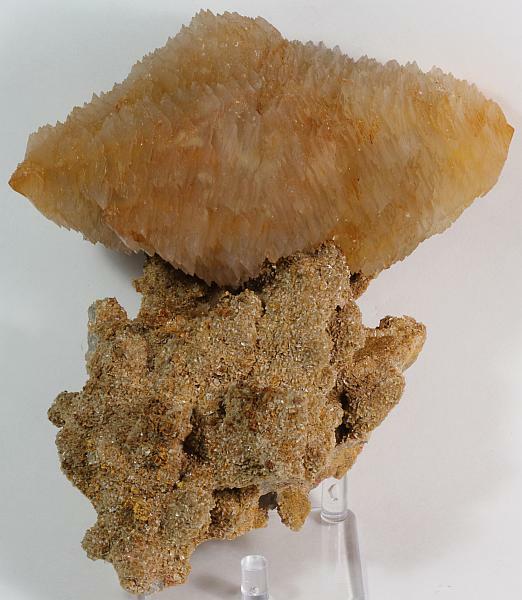 - Two views of this specimen that features gemmy tabular barite crystals on barite matrix. Barite & Druse Quartz – Blackwell Pit, Tiff, Washington County, Missouri - 15.5 x 10.5 x 9.7 cm. 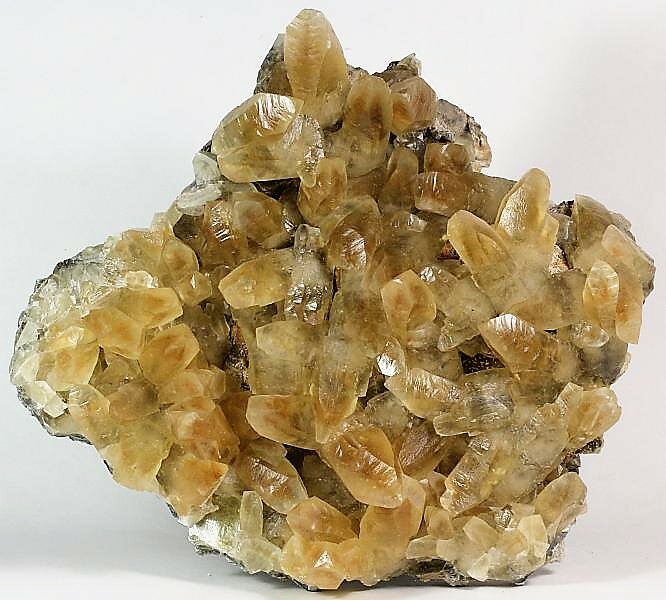 - “Bladed” barite is on druse quartz, a desirable combination specimen from the Washington County Barite District. 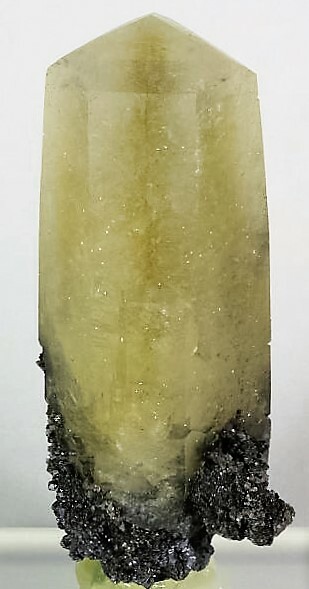 Druse Quartz with Limonite after Pyrite –Unnamed deposit near Maddin Creek, Washington County, Missouri - 30 x 29 x 15 cm. - Druse quartz is fairly common in Potosi Formation, and is usually found near barite deposits. This specimen has pseudomorphs of limonite after pyrite on the sparkling quartz crystals. ​Missouri also used to be a leader in iron ore production. 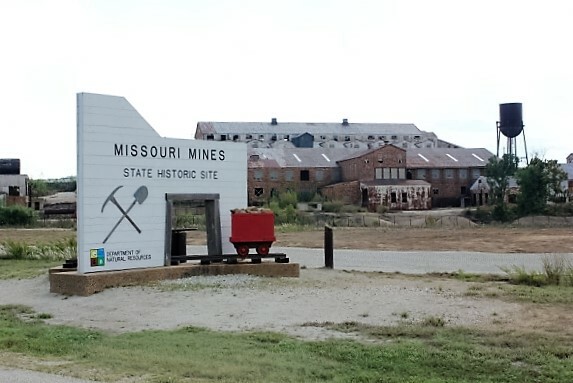 Most recently, the Pea Ridge Mine in Washington County was the deepest working iron ore mine in the U.S. Missouri had many iron ore mines operating the southeastern part of the state. Dr. Fred Pough, author of the famous “A Field Guide to Rocks and Minerals”, while attending Washington University in St Louis wrote his Master’s Thesis on iron ore mines in Missouri (mainly in Franklin County). Fine specimens may still be found in mine dumps and road cuts. 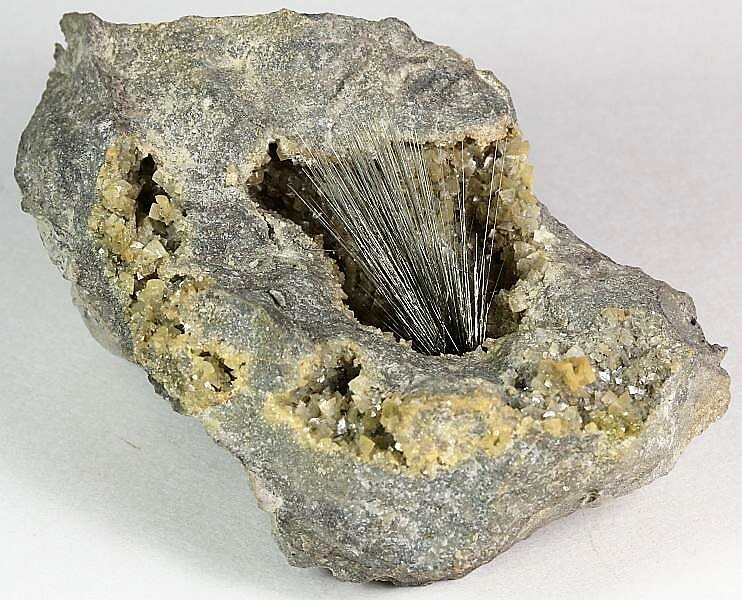 Bazzite on Quartz – Pea Ridge Mine, Washington County, Missouri - 8.7 x 4.9 x 4.9 cm. - This is the largest, as well as the richest, bazzite specimen ever found in Missouri. 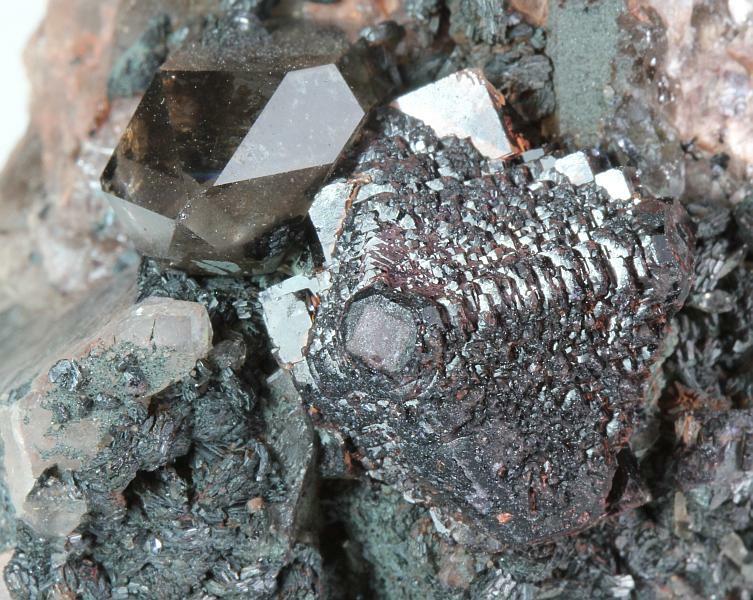 The small gemmy bazzite crystals contrast well with the iron-stained quartz crystals. This was reportedly found near one of the Rare Earth Element mineral-bearing breccia pipes that intruded the iron ore body. Bazzite on Quartz close-up - Pea Ridge Mine, Washington County, Missouri. Fluorite – Pea Ridge Mine, Washington County, Missouri - 3.7 x 3.5 x 2.3 cm. - Fluorite specimens were very uncommon in Pea Ridge Mine. They were usually purple, but some yellow ones were found. It was often hard to see what color they were because like this one they were usually covered with a dense hematite layer. 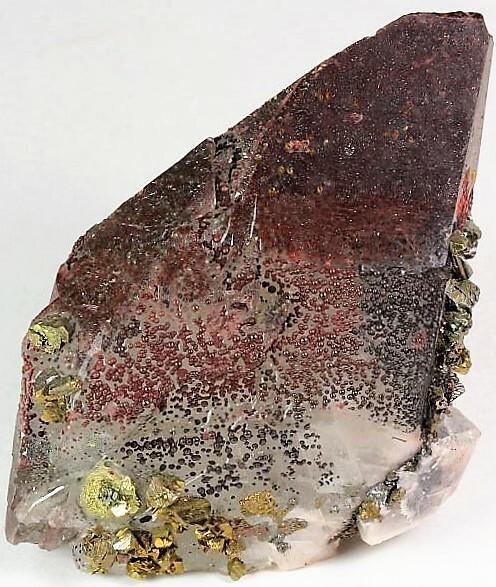 Chalcopyrite on Calcite – Pea Ridge Mine, Washington County, Missouri - 23 x 16 x 8 cm. - Chalcopyrite crystals richly cover calcite scalenohedrons. Amethyst – Pea Ridge Mine, Washington County, Missouri - 10 x 7.5 x 2.5 cm. 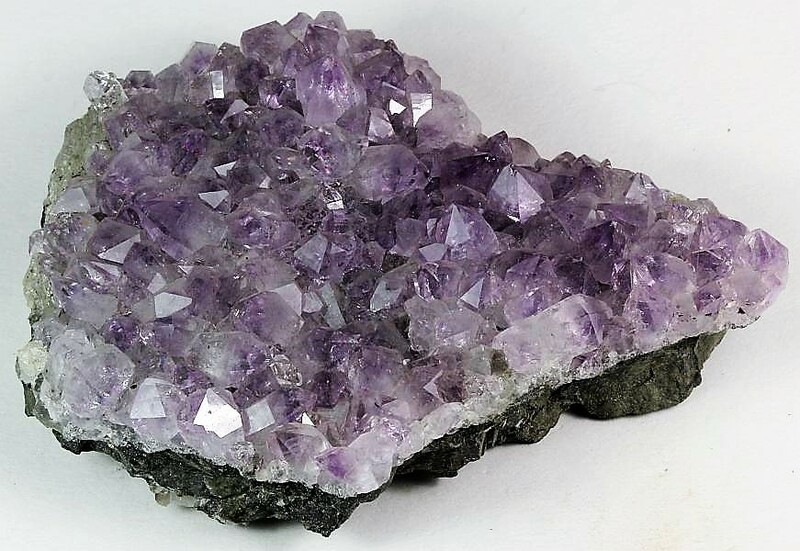 - Amethyst in Pea Ridge Mine is rare, only known from a few pockets encountered in the 1970’s. This specimen is typical from that find, with gemmy light purple amethyst crystals on a hematite-rich matrix. 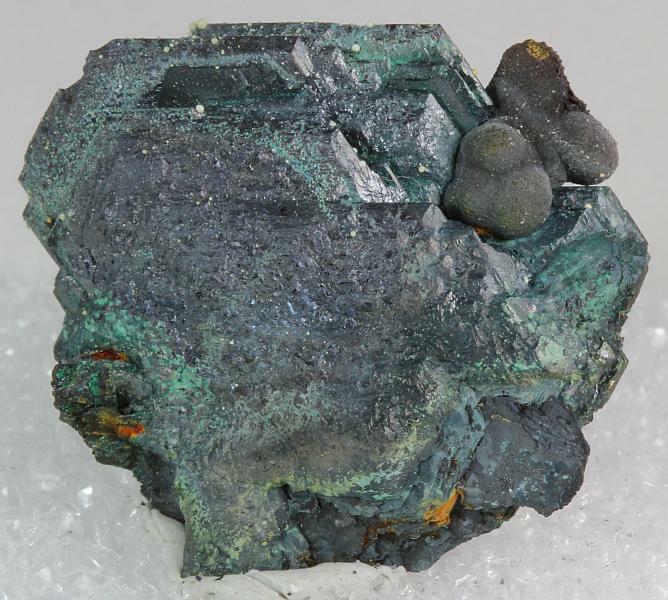 Malachite – Ruepple Iron Mine, Stanton, Franklin County, Missouri - 7 x 3.7 x 3.4 cm. 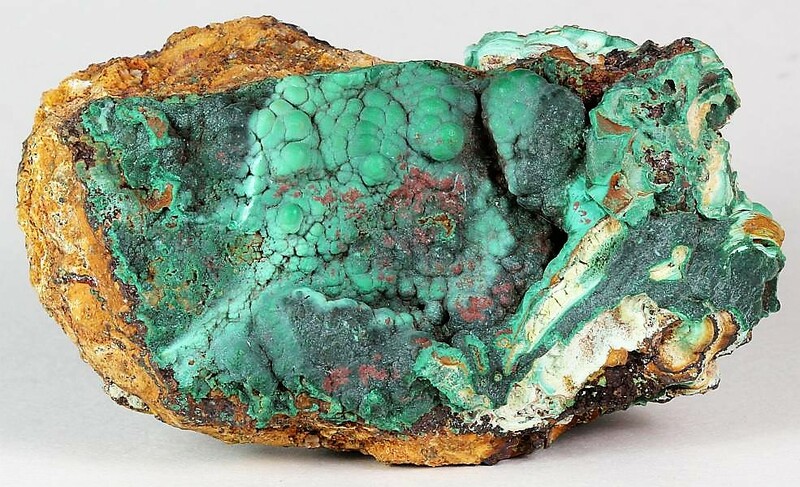 - Botryoidal malachite richly covers the display surface of the iron stained matrix. This mine is the major one that Dr. Pough studied for his thesis. 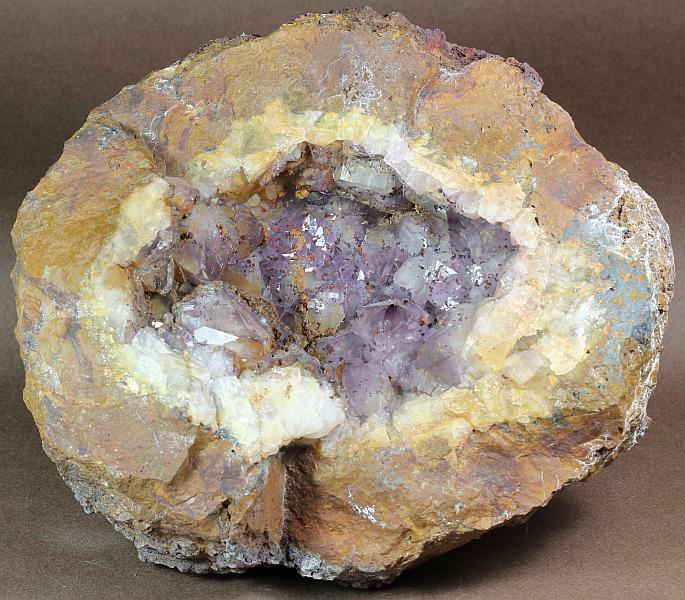 Amethyst – Moselle No. 10 Mine, Phelps County, Missouri - 19.5 x 17 x 10 cm. - The largest amethyst geodes found in Missouri came from this mine. The amethyst crystals in this specimen are lustrous, and have hematite needles and blades on and included within them. 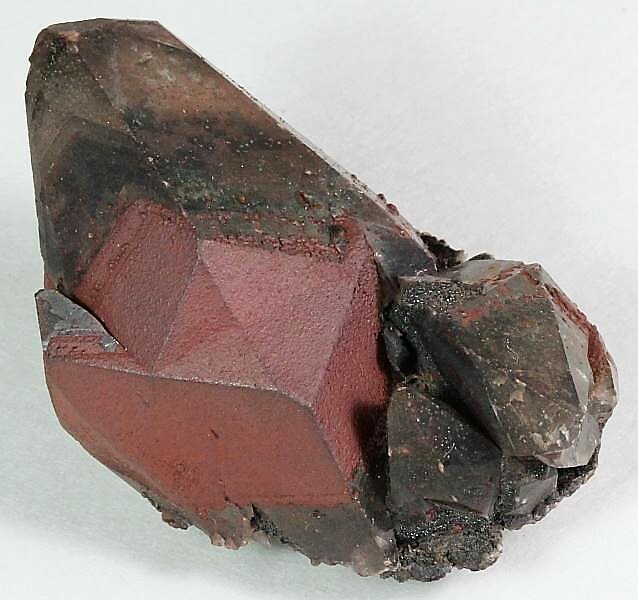 Hematite – Salem, Dent County, Missouri - 2.2 x 1.7 x 1 cm. 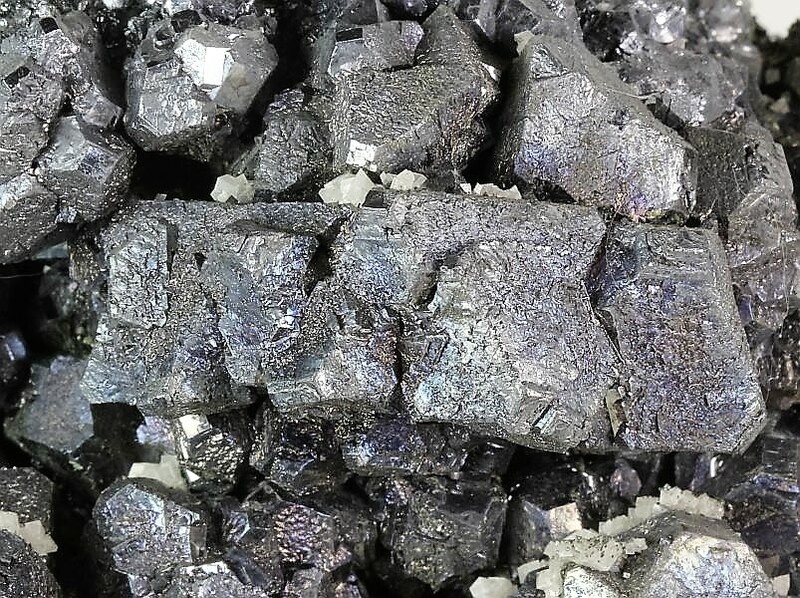 - Although this specimen is small, it’s one of the most aesthetic hematite specimens that I’ve found in Dent County. The land owner wants to keep the mine name anonymous so I can only tell you that the mine operated in the mid to latter part of the 1800’s, and has been closed for over a hundred years. Calcite – Pea Ridge Mine, Washington County, Missouri - 4.5 x 2.9 x 2 cm. - Many of the specimens found in Pea Ridge Mine have hematite and/or goethite on them, and this calcite is no exception. The crystal is twinned, and even has hematite inclusions within. 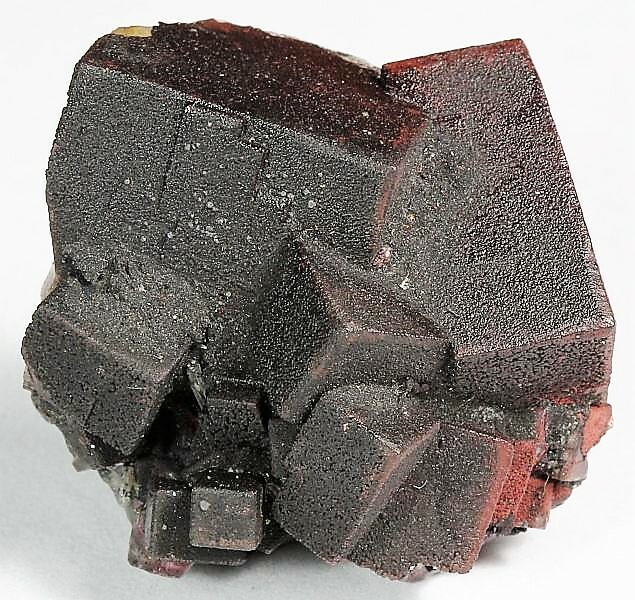 Hematite – Pea Ridge Mine, Washington County, Missouri - 3.6 x 2.6 x 2 cm. 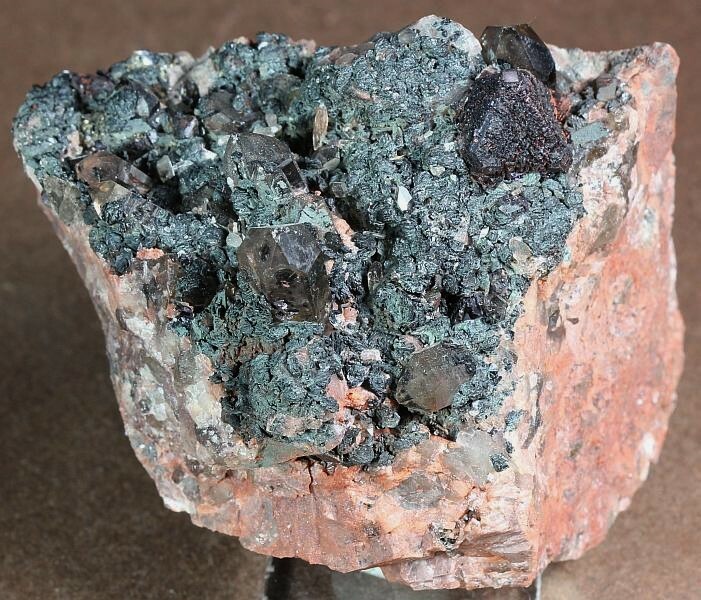 - Despite producing huge amounts of hematite ore, hematite crystals were fairly rare in Pea Ridge Mine.The form of the crystals in this cluster is pretty sharp and the luster is good. Calcite – Pea Ridge Mine, Washington County, Missouri - 6.6 x 5.9 x 4 cm. - This calcite crystal has goethite balls scattered on its surface, along with several brassy chalcopyrite crystals. 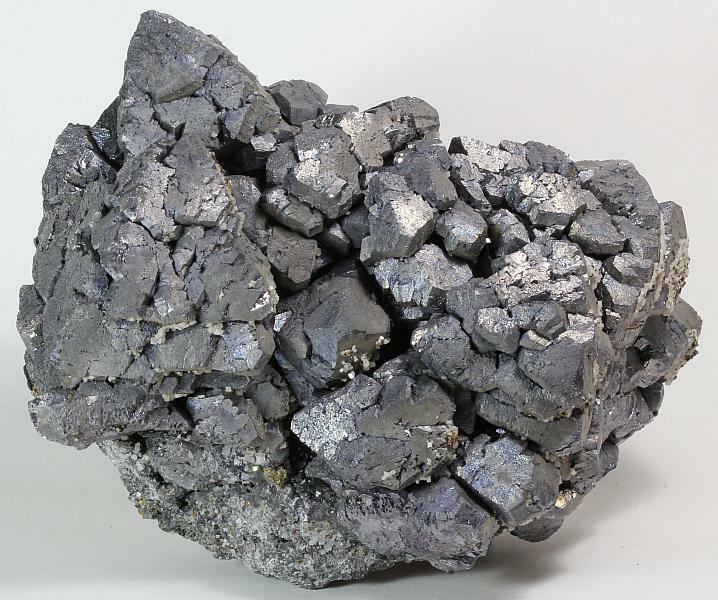 Pyrite – Pilot Knob Mine, Pilot Knob, Iron County, Missouri - 17.5 x 16 x 10.5 cm. 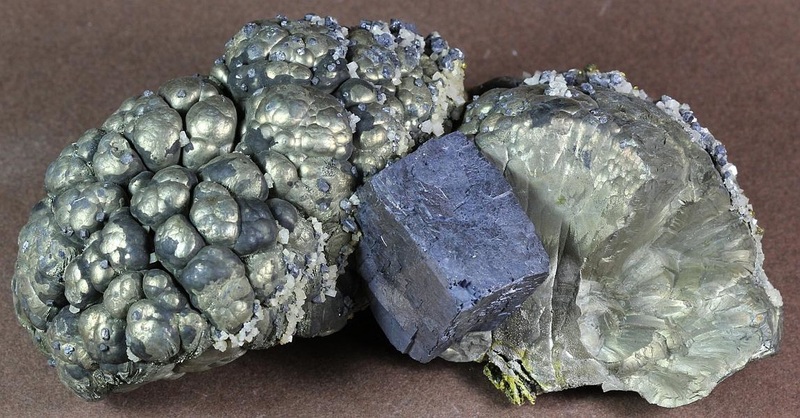 - Lustrous pyrite crystals are on a brecciated iron ore matrix, along with some minor dolomite crystals. 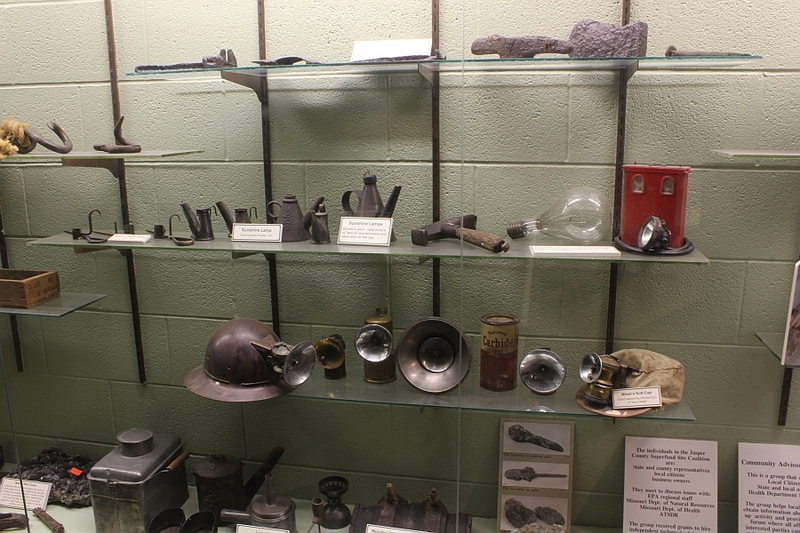 Missouri Mines State Historic Site display. 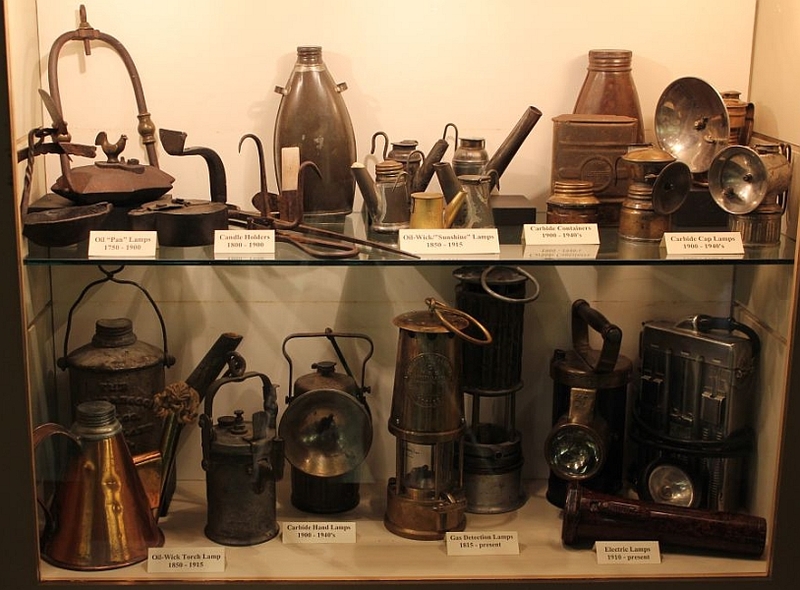 Everett J. Ritchie Tri-State Mineral Museum. 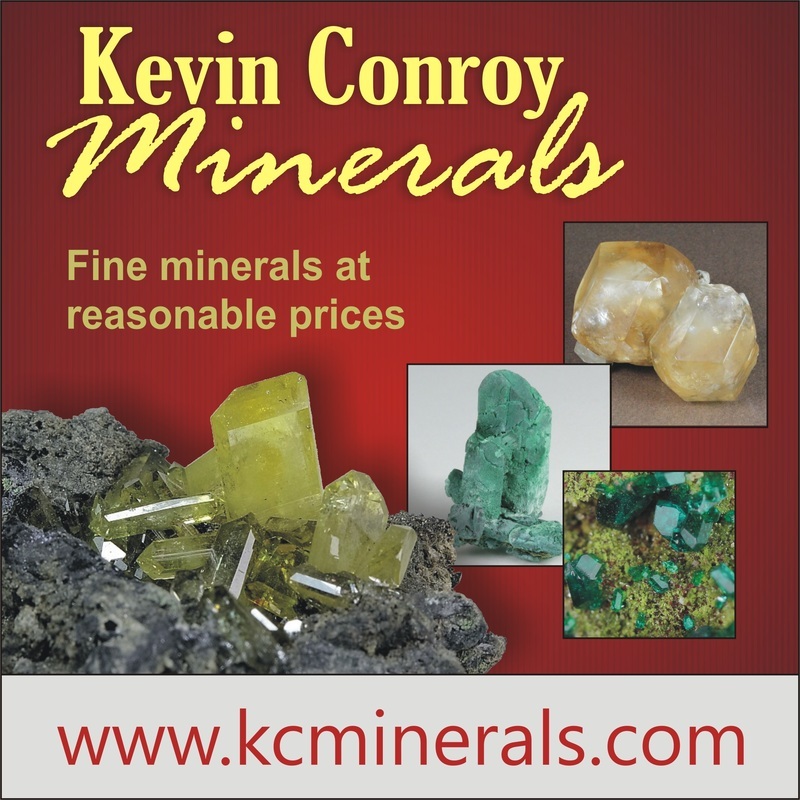 I got my start in collecting rocks and minerals over 50 years ago when I was six. My parents happened to buy a home near a creek that was loaded with all sorts of treasures (at least they were for a young novice collector). We took some of these finds to a rock shop in Saint Louis, Missouri that was run by Howard York, a man who I’ll be ever grateful to. He took the time to teach me a bit about minerals and fossils, and encouraged me to join a rock club. Well, that was it, I was hooked, and eventually earned my degree in geology. My collection includes some minerals that I self-collected underground in the Tri-State District, Pea Ridge Mine, Sweetwater Mine, Brushy Creek Mine, Buick Mine, Elmwood Mine, numerous surface deposits, quarries and road cuts. Field collecting is still a love of mine, even though the places that grant permission to collect are ever dwindling.